Calcite treatment on my blog is indicative of a larger problem with amazing crystalline allies--we often take the best ones for granted. Calcite, I vow to do better by you! How I've gone a year without talking about Calcite is mind-blowing to me, but here we are. Beautiful Calcite--abundant, useful, healing. It is tough to know where to begin with it. There are so many varieties of Calcite--colors and uses; each could get their own write-up. 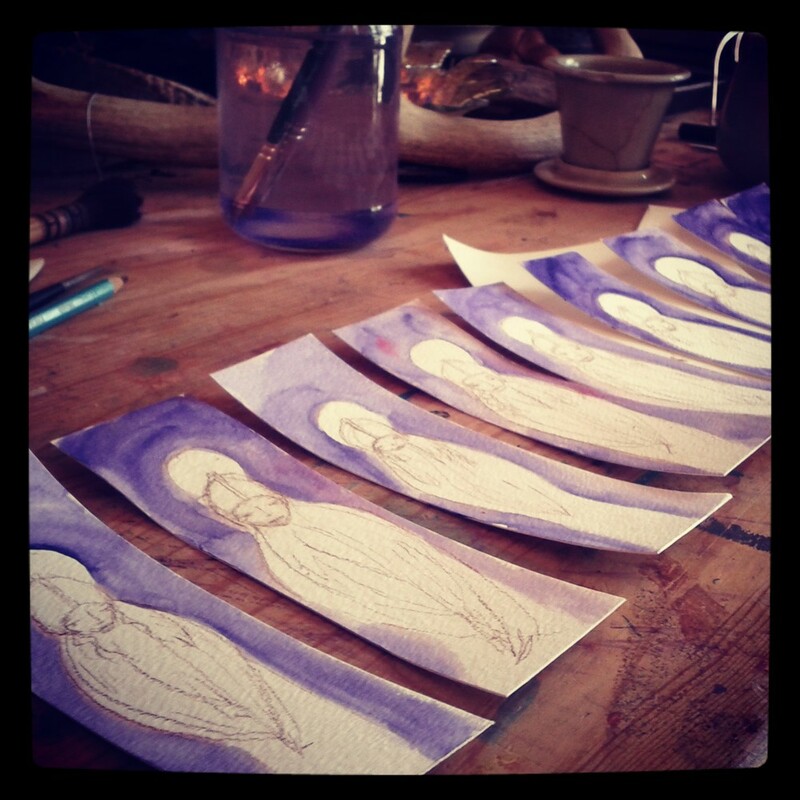 Rather I'm going to take a few of the lovelies I use in my practice and share their uses and wisdom. Calcite is a calcium carbonate mineral with a hardness of 3. It is one of the most abundant crystals, and is found on every continent. It occurs in countless colors and formations, but most Calcite works gently to remove blockages and cleanse the auric field, so it is a wonderful ally with its coordinating chakra. I've known many crystal healers that use full Calcite layouts, since there is a Calcite for each chakra. And certainly, you can find large Calcite reasonably priced. Calcite is often confused for other stones, like a gemmy Rose or Smoky Quartz, or even Snowy Quartz. Calcite has a waxy look to it, like it's been dipped in wax. For geologists, there are some ways to tell the difference. Some Calcite fluoresces under a black light, which always looks cool. Calcite bubbles when Hydrochloric Acid is dropped on it. (Why, yes, I do have HCl in my geology toolkit.) It is significantly softer than Quartz, which means it is easily scratched with a Quartz crystal, but not the other way around. (Of course, you then have a scratch on your Calcite.) My kids often come in my house with rocks that are treasure, and they claim it is quartz. These are some easy ways to tell the difference. Some of the most useful varieties of Calcite are Orange, Blue, Green, Optical or Clear, Honey, Pink Mangano and Stellar Beam. Clear Calcite, sometimes called Icelandic Spar, is colorless, and often comes in rhombohedral shapes. It is double refractive, so when you view something through the Clear, it looks like it is doubled. It resonates with all the Chakras, but like Clear Quartz is a particular ally to the crown, helping with insight, clarity and forgiveness. Calcite clears out those blockages, so think of clearing stones as one to pave the way for compassion, empathy and forgiveness. I most often use Clear Calcite, or Optical Calcite in layouts where I need clarity and focus around a topic, most often forgiveness layouts. Blue Calcite resonates deeply with the throat and third eye, a wonderful combination for channeling and psychic work. It is incredibly calming, and helps empaths deal with other people's emotions. I find it to be incredibly spiritual and resonant. It helps remove blockages in the third eye, clearing the way for psychic work, dream work, and visioning. It also can help with clarity, but in a different way than Optical, though they would work beautifully together in this way. Blue Calcite helps remove that great "I" vision of only seeing things from one perspective, and is particularly useful for people who can't "see" the other person's point of view. Green Calcite resonates with the Heart Chakra, and all you have to do is hold this stone to feel that energy. It also has that beautiful calming energy on the emotions, particularly anger from heartbreak. Calcite's reputation for removing blockages isn't limited to the other colors only, Green Calcite helps remove blockages in heart issues, like resentments, anger, and unhealthy patterns in relationships. Like many green stones, it is great for physical healing as well, so you can place it on a bruise or strain and the pain dissipates. I love using Green Calcite in Metta meditations, or lovingkindness meditations. Orange Calcite is probably the Calcite I use most often in my practice as it beautifully works with the Second or Sacral chakra, and yet isn't as full-on as some other of those sexual and creative stones. Yes, it helps remove blockages to creative and sexual energy. I find it a wonderful ally to those going through menopause. It is an energetic stone, and helps to transmit a kind of passion and energy that doesn't overwhelm, but inspires. It is great for stimulating the metabolism and helping to add a little fire to the mix. Orange Calcite removes other blockages too. I find it is a wonderful ally for discerning what is not serving one's Highest Good, and for release ceremonies, particularly with fire. One Calcite that my partner uses often, but is not in my toolkit is Mangano Pink Calcite. It also resonates with the Fourth Chakra, or the Heart Chakra. It is a stone of empathy from my understanding, and helps people who have difficulty connecting with their emotions. It is one of those stones I need to work with and understand more before I share more, so if you are tuned up with Mangano, share your experiences in the comments. These are the Calcites in my practice, but Honey Calcite is quite abundant, though I don't work with it often, resonating with the Third Chakra, or Solar Plexus, and Stellar Beam Calcite also a great metaphysical ally. And Red Calcite resonating with the Root. Let me know how you use Calcite in the comments. And as always it is my great honor to talk about crystals with you. A few months ago, working on a client, I had this amazing vision of Mother Earth knitting a blanket to put over a client. 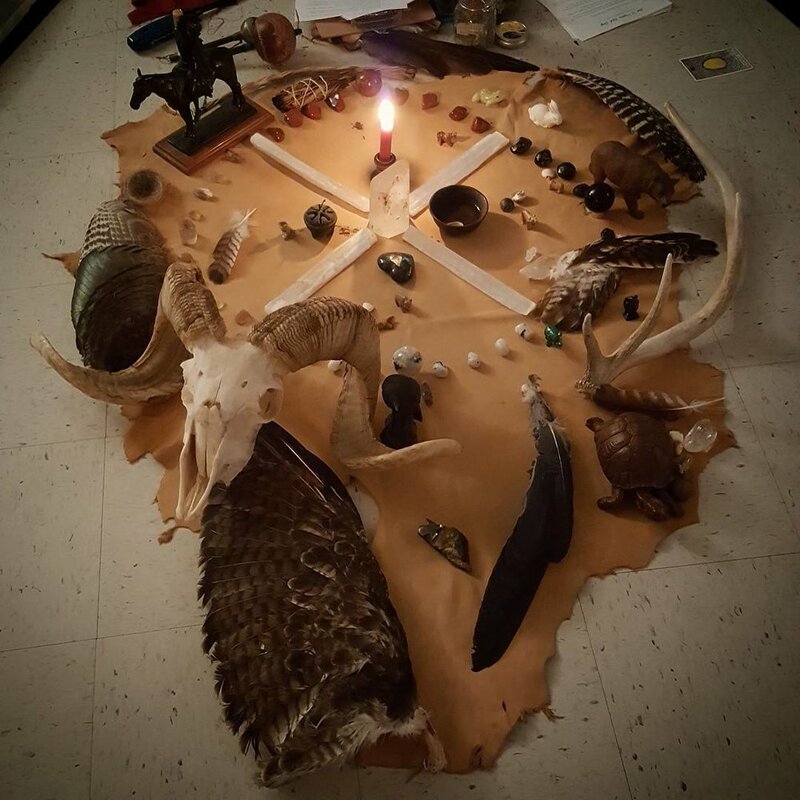 I often Reiki the feet, putting my sitz bones on the floor of my office to connect with Mother Earth during crystal healing sessions. I see the most incredible scenes of nature and healing in that space of quiet with a client. This one in particular was so intense and beautiful, I was almost drawn to tears. The blanket itself was knitted with moss, leaves, flowers, and dirt. As Gaia finished this incredibly healing blanket and placed it over my client, it turned into a heart--a Chrysocolla heart, to be exact--that warmed her in much the same way as a blanket would. I have carried that image around with me since then, thinking of this earth-knitted healing we must do over our hearts. I'll be honest, I don't work with Chrysocolla much. I have a few tumblies for when my intuition pushes me to share with a client for their healing mojo bag. But with 4000+ types of crystals in the world, it is not surprising that most get left off my list of crystals I always work with. But this vision...I couldn't shake it. 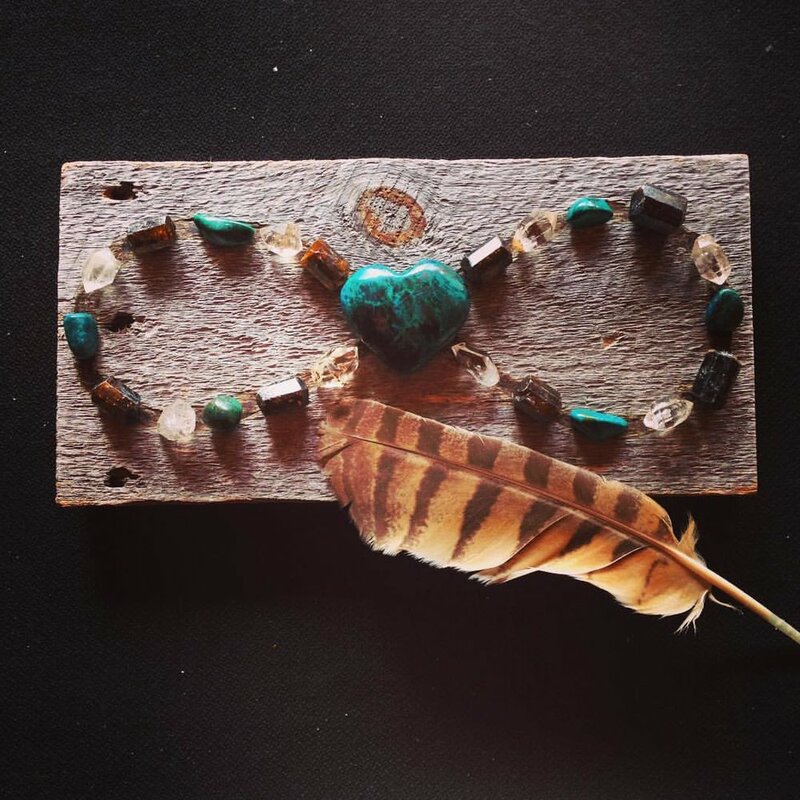 And a few weeks ago, while at my local metaphysical shop Heaven & Nature, I spied a Chrysocolla heart and scooped it up. Chrysocolla is a copper silicate, which shouldn't be surprising with those amazing colors. It has a Mohs hardness of 2-4, which also means, beyond just the copper content, it shouldn't really go near water. It is often found with other Copper silicates like Malachite and Azurite, and sometimes has Cuprite in its mix. It resonates with the throat and heart chakras, and has a strong root connection. 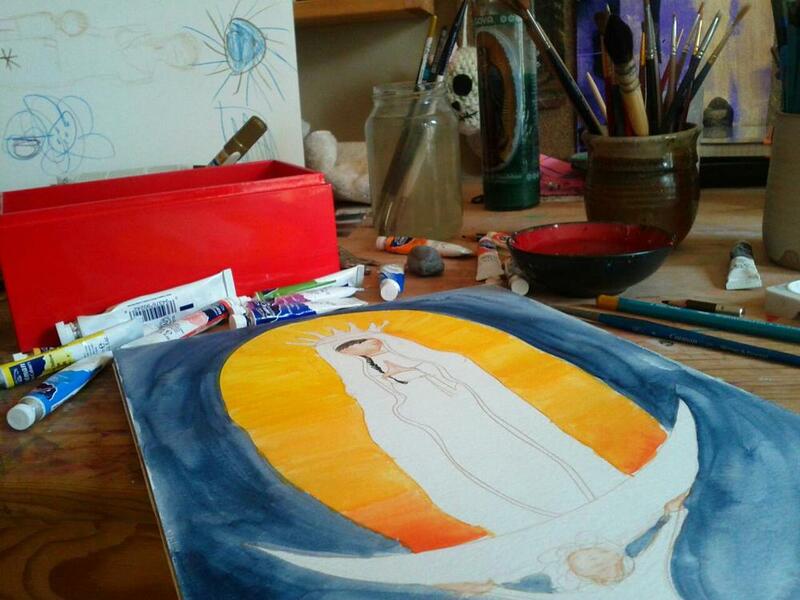 For me, it feels strongly feminine, maybe because of my vision of Gaia, and very healing, nurturing and maternal. The connection between the throat and the heart is a strong, beautiful healing bridge. That bridge in and of itself can be empowering, if we can make that energetic flow possible. Chrysocolla seems like a perfect ally in this way, helping one express their power with heart-centeredness. When I say a stone is feminine, this doesn't mean it is off limits to men. Quite the contrary, feminine stones, I'm thinking Cuprite and Moonstone, can be strong allies for men to balance with the Divine Feminine within themselves, just as women can benefit from some masculine stones like Pyrite. Chrysocolla seems to open a channel to Gaia, or at least, that is what my vision seemed to tell me, to receive her Divine nurturing and love, as well as pass that onto those around you. Naisha Ahsian, in the Book of Stones, talks of Chrysocolla as a teaching stone, and a great ally for those in the speaking professions. "Chrysocolla is a powerful model for consciously considering the way one puts one's energy into the world," she goes on to share. "One can speak and say nothing, or remain silent and speak volumes. Chrysocolla teaches the value of both sound and silence." This to me was an AHA moment, as I am learning this hard lesson right now, as I navigate silence and speaking in new ways. I'd love to hear how you interact with Chrysocolla. As with every stone, I am working with Chrysocolla to learn more about its energies and lessons, and invite you to journey with her. I have written about grief quite a bit. 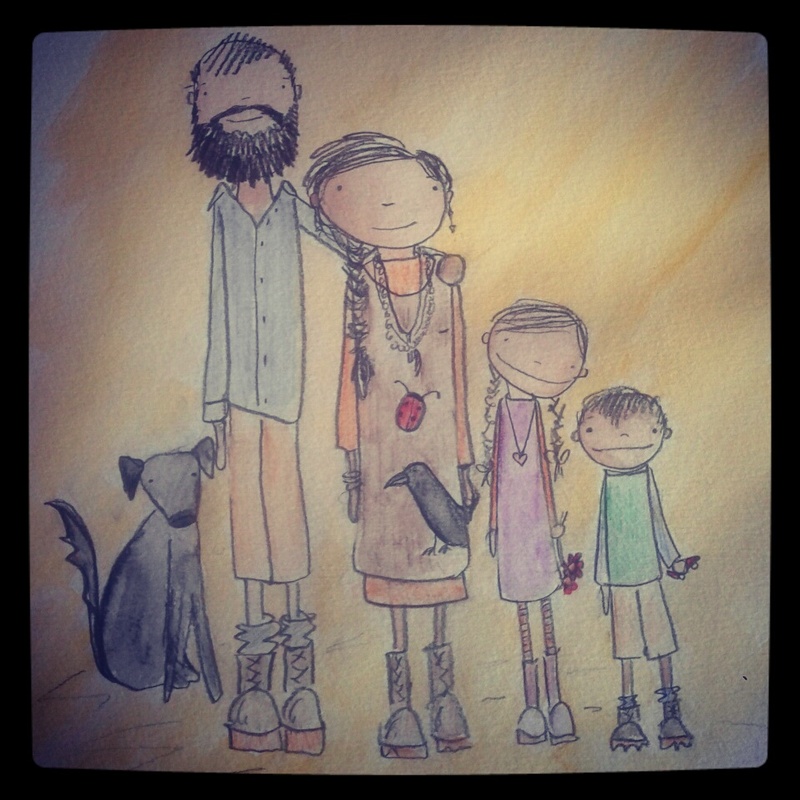 For year, actually, I had a blog devoted to discussing grief and parenting. It surprises me that I haven't written about stones for grief support. 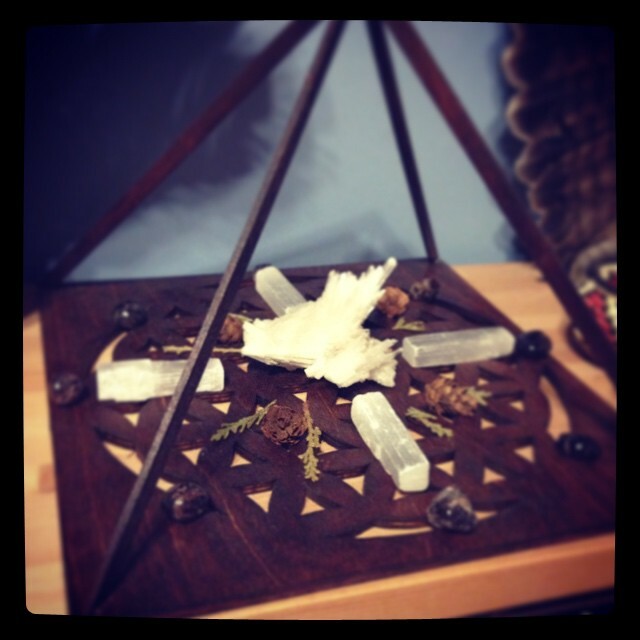 Why crystals for grief? We often feel helpless when others are walking through the Dark Valley of grief and loss. We ourselves feel lost and in a dark wood when we have lost someone close to us. I certainly walk through cycles of grief in my life. My daughter died on Winter Solstice, and the time when the day is shortest, I begin my descent into the cold world of grief. And yet, it isn't as desolate and cold as I imagine. Grief is the deepest expression of love and longing. We do not grieve that which is unimportant to us. Each year as it approaches my daughter's death day and birthday, I find myself remembering those dark days of comprehending the impermanence of the human condition, and the reality that we will live without her bright soul. I welcome that time. For most of the year, I live this life without her. It is an ache I have grown accustomed to. Yet there is something comforting and necessary about my season of grief. Rather than a sad time, it is a time for my family to come together and love her, honor her, parent her. We hold her together, our collective memory, our survival of this horrible situation. This grief grid was created for grieving parents on Kindness Day in 2013. It contains Rose Quartz, Green Aventurine, Dravite, and Apache Tears. Under the center stone contains the names of the parents and the child they lost. We tend to label grief as BAD. But in my experience, grief opens a door to love. It is a heart-centered experience. And grief is not just one emotion. It is an experience of many emotions and thoughts--joy, gratitude, anger, sadness, longing, loneliness, guilt, pride, compassion, empathy, selfishness...I could go on all day. Remember it is when we suppress emotions, feelings, instincts, that our body begins to manifest dis-ease. But when we honor the emotion--good, bad, ugly--we honor all of our human-ness. That is why we are here, after all. A spiritual being having a human experience. Crystal support during these times of grief is incredible helpful. Most crystals recommended for grief support help us remain heart-centered. The first stone mentioned with grief support usually is Apache Tear. Apache Tear is a form of Black Obsidian. The lore around Apache Tear dates back to the late 1800s. A group of Apache warrior in battle against US Calvary were outnumbered and facing defeat. They chose to ride off a cliff than be killed by the American soldiers. It is said that the women of the tribe cried tears on the mountain over their fallen men, and their tears turned to stone as they hit the ground. Apache Leap Mountain is where this took place, it located in Southeastern Arizona. It is quite beautiful there. You can read more about the legend here. Because of this lore, it is said to assist with grief and loss. Another beautiful stone for grief support is Dravite, or Champagne Tourmaline. It is a dark brown Tourmaline, and it is wonderful to help ground and emote. And also it is wonderful for self-care and self-love, which are two things most of find difficult in times of emotional struggle. I am also fond of Smoky Quartz for grief support as it is a strong protector and grounder. Remember that most of our fears of emoting and feeling grief is feeling out of control, or that once we start crying we will not stop. These black stones actually help you feel safe, secure and allow you to emote. It also protects your feelings from others. Think of how vulnerable we feel when we are emotional or grieving. If we see a Hallmark commercial, we burst into tears. Well, these dark stones--Dravite, Smoky Quartz and Apache Tear--help protect your EMF and keep your feelings to yourself. I also include heart stones in grief mojo bags or grids. Some great stones to includes are Rhodochrosite, Rose Quartz, Green Aventurine, and Garnet, which is not usually put into the mix here with grief, but I think it is a wonderful ally. So, you have these stones, now what? I love to gift a mojo bag of stones to a friend who has just lost a relative, friend or pet. But grief is not limited to the death of someone. We experience grief when our marriage falls apart, or we lose a job, or get sick and face a new way of living. Grief experience should not be limited to one experience of grief--death. So, yes, MOJO BAGS! It is a great support. I also love to create grids for my friends who are experiencing grief or death anniversaries. And send them distance Reiki. I always ask permission (Number one rule of energy work!). In my newsletter this week, I began writing about vulnerability and shame. 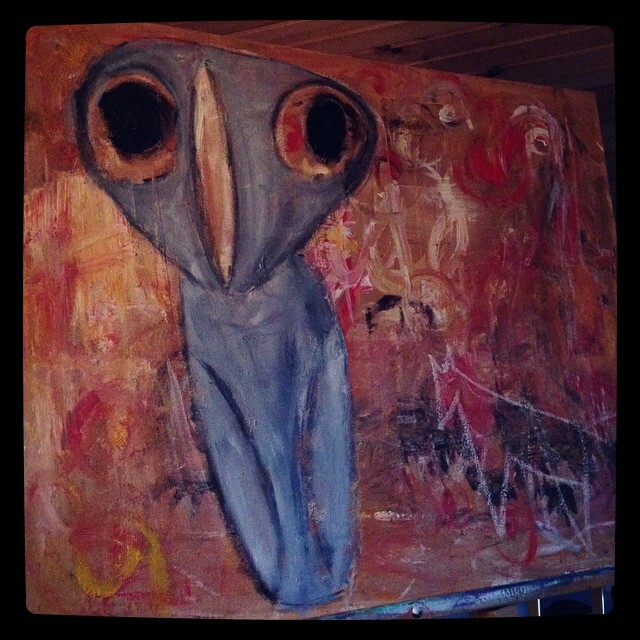 It morphed into a piece about friendship losses. Losing friendships has been such a profoundly difficult part of my life--one where I feel most vulnerable perhaps. Friends truly are the soul family we create. I have valued each person I call a friend throughout my life as a teacher, a collaborator, a spiritual partner, and a gift. Upon reflection, some friendships were there to show me parts of myself I would have rathered stayed cocooned in the back closet of my soul, yet those instances have been the greatest teacher, catapulting my spiritual growth. You can read the newsletter piece here. I wanted to share thoughts and tips on how to deal with friendship loss on an energetic level and healing oneself. I am not going to be giving any words on how to heal the broken friendship, but rather how to heal the broken heart. Here is what I believe is important to care for yourself and nurture your spiritual growth through a friendship loss. 1. Don't call every person you mutually know to tell them about your friendship fall out. Allow yourself one telling of the story to another person--your sister, best friend, mother, therapist, or sponsor. Gossip lowers our vibration. When you retell the story, you stoke your anger. You feed that particularly wolf. If we don't play back the storyline of injustice that we are inventing in our head, and just sit, we can begin to feel the feeling that we've been pushing off and ignoring. So, just allow yourself to feel the hurt, rather than tell the story. See how the first is heart-centered and the second is not. The latter is getting yourself out of your hurt, and moving into other fiery places like your sacral and root where justice can be perverted into revenge. 2. Take responsibility for your emotions. Your friend did not make you angry. You felt angry as a result of your friend speaking her truth. Very different. If she is purposely trying to hurt you, then take responsibility for not putting up your guard. It is not that your friend is not culpable at all, it is simply that we must be able to, as the Serenity Prayer says, "...accept the things we cannot change...change the things we can...." We need to understand what is our emotion, and what is an issue in the friendship. I had a friend who told me she needed space. First thing I did was shoot off an email to her telling her I was there for her. She just told me what she needed, and I did exactly what she asked me not to do. In my desire to fix things immediately, I overstepped the boundary she created. So also take responsibility for your role in the friendship loss. It is important, without beating yourself up, to own your role in the friendship. That takes pure heart-centeredness and self-compassion to own your role without taking all the responsibility. It takes practice to not judge yourself, so allow yourself to be quite terrible at this in the beginning. Just know you'll get better the more you do it, and the more heart-centered you are. 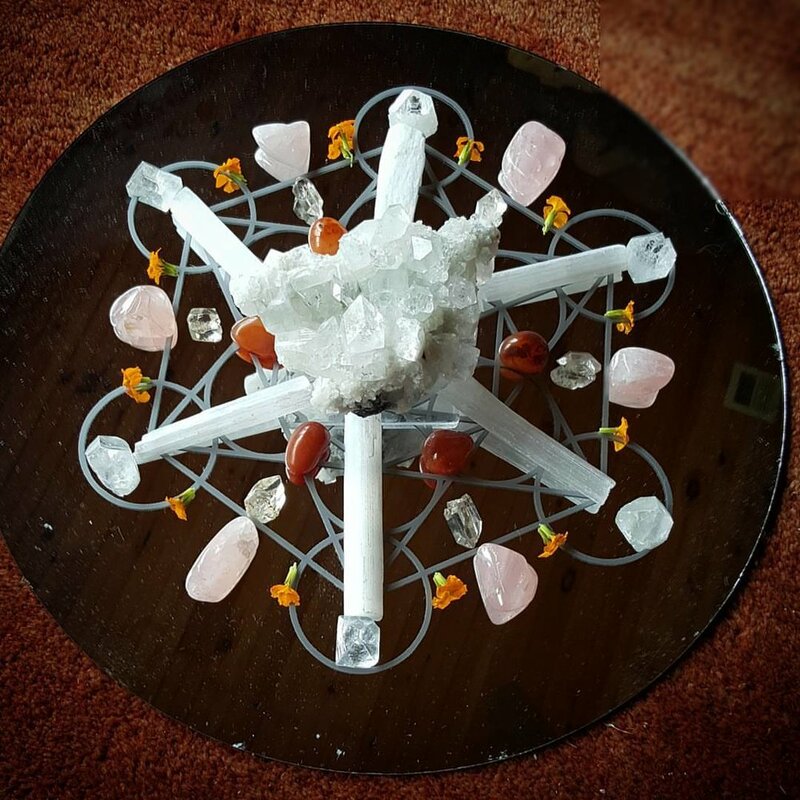 This grid is centered with Rose Quartz tower with Rose Quartz coming out from the center, then Dravite (or champagne Tourmaline, a wonderful stone for self-compassion), on the outer ring, Rose Quartz, Malachite, and Rhodochrosite. 3. Remember you are hurt, injured, and grieving, so treat yourself as such. Self-care is A Number One. Baths. Meditation. Lots of rest. Detox from Social Media. Eat clean, whole foods. Don't drink alcohol or use drugs. Feel the hurt. Cry. Practice Reiki or energy healing on your heart chakra. Or get energy work done. 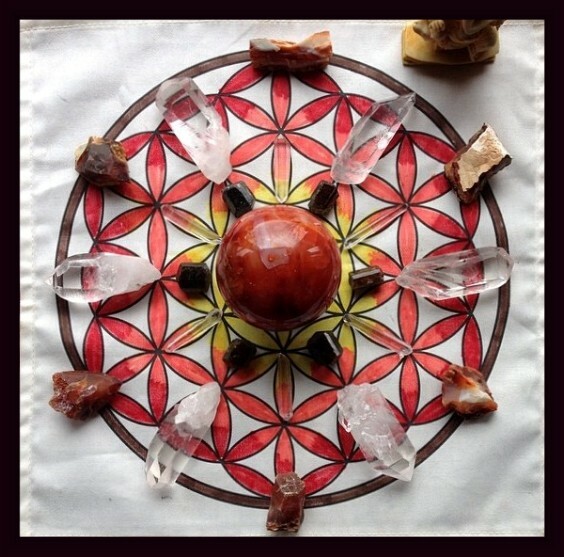 Surround yourself with stones for self-love--rhodochrosite, rhodonite, rose quartz, green aventurine, jade, watermelon tourmaline (or rubelite or pink tourmaline), and any other heart chakra stone you have close to you. I often do a grid for self-love during these times. I use aromatherapy for the heart and healing--rose, bergamont, sandalwood, orange, lemon, neroli, ylang ylang. 4. Write a letter from your Shadow Self. When you are fired up, a great tool is to allow your Shadow self to write a letter. See, your Shadow (a term coined by Carl Jung) is your shame, the part of yourself you might not accept. Maybe you want to believe you have evolved so fully from being petty, angry or unforgiving that giving your Shadow any voice would give her power. If we do not accept these normal human parts of ourselves, our Shadow comes out in all kinds of dark ways. Give her voice. Listen to her. What you are listening for is where your hurt stems from, what places in your childhood this situation is activating, what other situations in your life (past or present) does this pain remind you of, and what you can release. I reassure my Shadow Angie that she is not alone, or that she is not diseased or a damaged person. This is a key to healing. It is not the suffering that is the problem, or the failure of a friendship, it is the feeling of shame, isolation, and loneliness that leads us to numbing behavior, seeking revenge, or self-punishment and depression. "I am the only one who feels this way," our terrible suffering tells us. No one is ever the only person to feel that way. Even if it is the ugliest, most horrible thought, others have had it. I allow my Shadow Self to have a say. I let her write a letter to God. You can address it to your guides, the universe, or your Higher Self if you struggle with God. Just sit down. Alone. No one else in the entire world will read this. It is secret medicine, and it is the point of the thing. Now, with your vulnerable, most open self, write about every feeling you have had regarding the loss of this friendship (this works with nearly all issues that come from shame.) All the ones you have called ugly, petty, shameful. Write it all. Don't hold back. When so and so did that, I was so mad, I wanted to punch them in their stupid nose. How could they be so cruel to me? Don't they know who I am? Why don't they like me? Why do I keep suffering like this? I will never love another person again. If I could talk to so and so, I would tell her that She doesn't know what she is missing. I'm a great friend. When she said I was self-absorbed, I was so angry, because my grief is a big deal, and I need to be self-absorbed right now. Spirit can handle all these thoughts and does not judge. Give them release. When you are writing, you may cry and get angry and say WHY ME?!? a thousand times. That is okay. Give those shadow thoughts a voice. Let them see the light of day. What is giving them power is their darkness. And in the sunlight, you will be able to see that you are just a hurt person. Not a bad person. Here is where you tell the story for the last time. And then you fold up the letter, and put it in a box that can be a kind of God Box, or a Spirit Box. Some people use a shoe box, or a wooden cigar box. Once you put that letter in the box, you have now turned this entire situation over to God, or to your guides. You are allowing them to take it from here. So stop saying the same thing in your head that you just wrote down. Once you put it down, you don't have to pick it up again. 5. Invite your Higher Self into the Conversation. 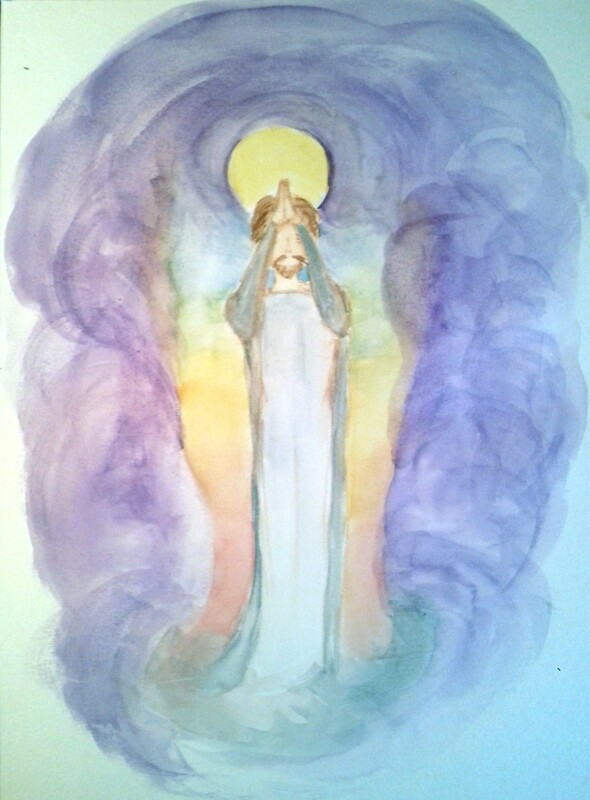 I journal after a God Letter, and ask the question, "Spirit (or Higher Self), what do I need to learn from this situation?" This is where I invite my Higher Self into this conversation. Compared to your Shadow Self, your Higher Self is the part of you that knows your Soul Purpose, your life lessons, and taps into the Divine Source. You can get there through meditation and receptivity. Breathe deeply. 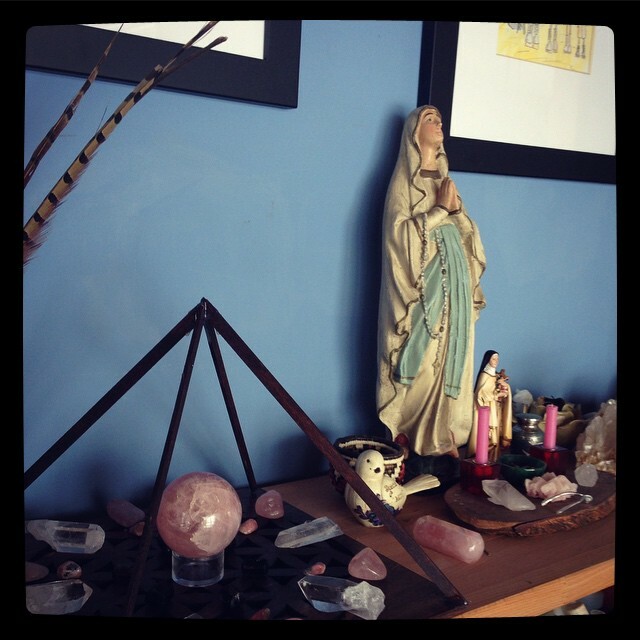 Create a Sacred Space. Ask for guidance. I transform self-pity into self-compassion. I open my heart and trust that my Guides will provide me with friendships that are meaningful and important. I speak my truth with compassion, calm, and love. I am accepted wholly and fully, just as I am, by Spirit. One thing to remember, when I asked the question, "What do I have to learn from this situation?" in a Spiritual Counseling session with Rita Strough, she told me, "You are ascending and need to attract like-minded spiritual beings. These friendships fall away so others can come in. You did nothing wrong. They did nothing wrong. You are just making room for new people." That truth I see over and over again in my own readings with people--friendships fall away, so people with similar vibrations can come in. There isn't anything wrong with person A or person B. When we raise our vibration, we attract people with similar vibrations, and release the ones who don't resonate with us. Why would that make us angry? Even when someone hides their fear in attacks against us, we need to realize they are simple not resonating with us. Isn't that a much different perspective than "I am a bad person" or "I'm not likeable"? 6. Release what is not serving your Highest Good. 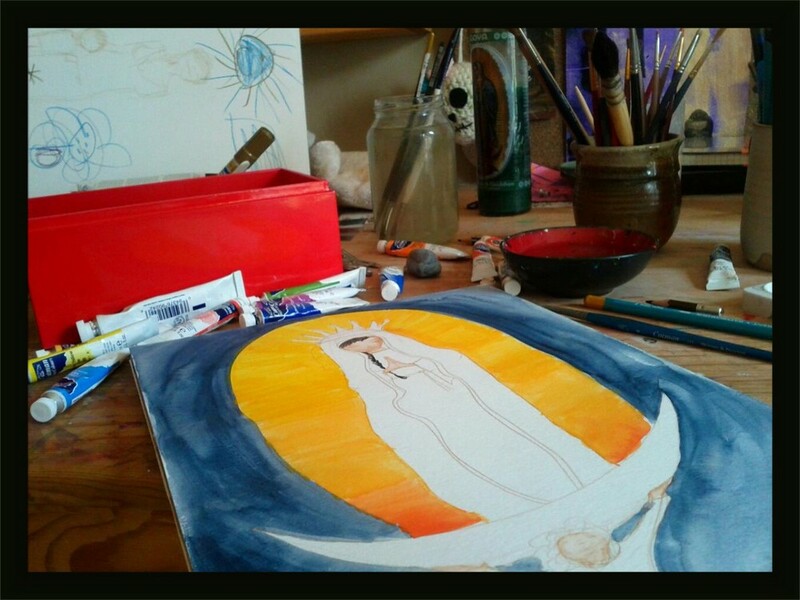 I find ritual very cathartic, and so on release days--Equinoxes and Solstices, as well as Full Moon rituals, when I am absolutely ready to be done of this friendship drama, I might burn the God letter with the slips of paper containing that which I want to release from this situation. 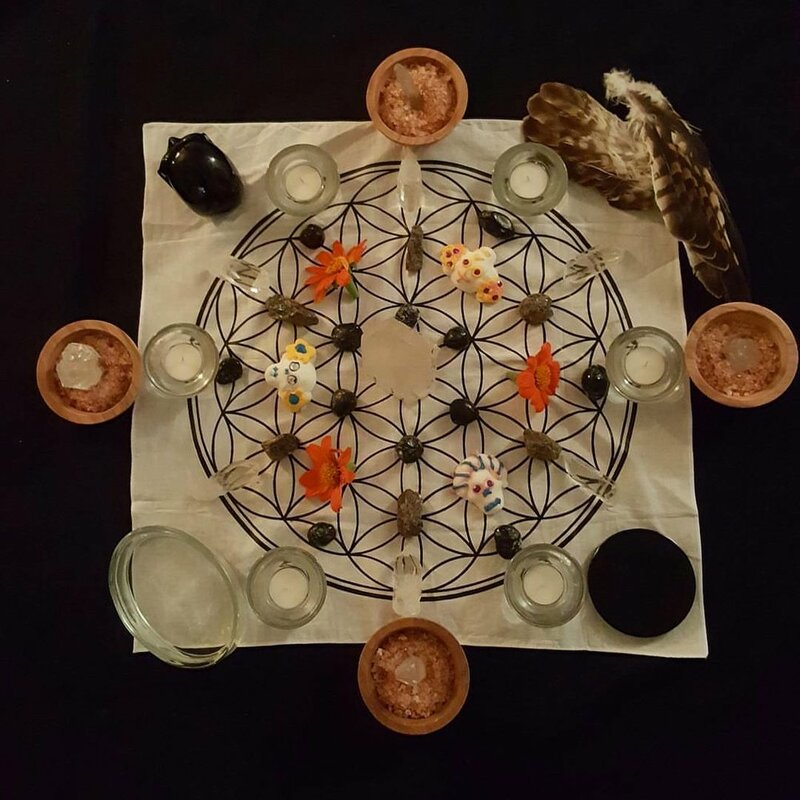 If you are working with a medicine bundle, or intention setting, remember that Spirit often gives us these situation specifically SO we release the things not serving us. 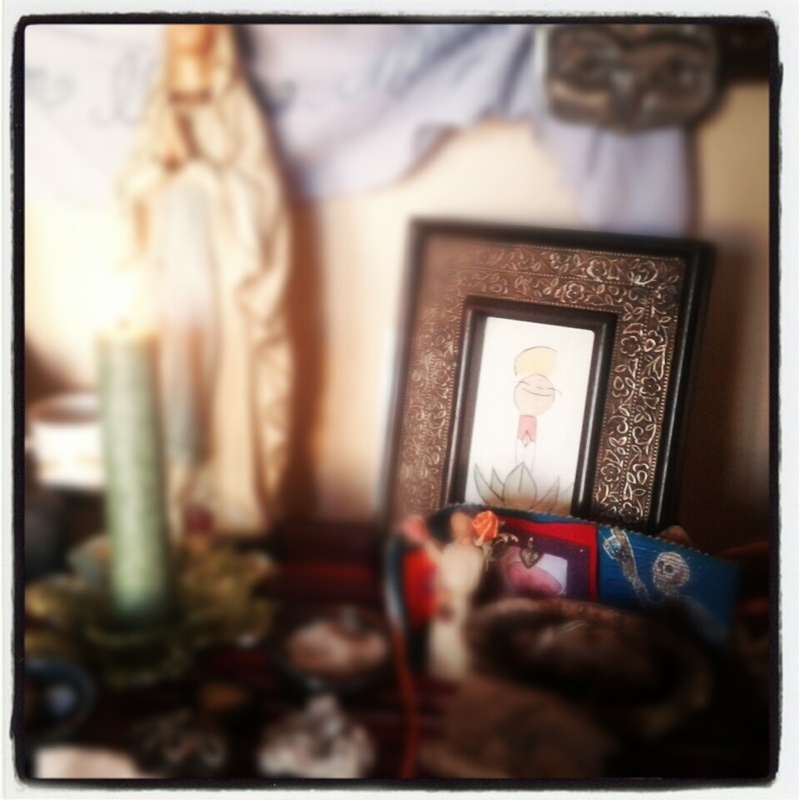 I keep my transformational statement to carry in my medicine bundle or on my sacred space/altar. I say them every day for a moon cycle. 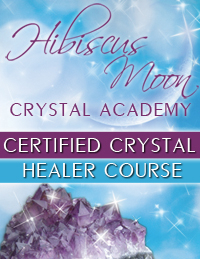 When you are releasing something using the moon cycles, I release during the Full Moon or waning moon period. I set intentions during the New Moon period, and ask for growth in the waxing moon period. And also, I don't just do this. I wait until I am ready to release. Give yourself time to process your loss and understand what it is you are releasing and why. 7. Forgive easily and often. My first and final act (so this should be 1 and 7) is to pray for my friend. I don't know how to forgive in any other way than to begin praying for the other person. It requires nothing but willingness. I don't even have to release any anger or guilt or hurt. I actually get on my knees for this one, because it signals to Spirit that you are ready to embrace the humility needed to heal. Ask for your friend to have everything you want for yourself--peace, friendship, health, happiness, joy and understanding. Ask for your friend to know Spirit. When and if you have more karmic work to do with your friend, ask to bring them back into your life in a way that is peaceful for each of you. Express gratitude for the lessons (no matter how hard) they brought to you, and for showing you the places where you need work releasing attachment and ego. This is the way I have learned to forgive someone--to see them as a Divine Being of Light, as a hurt person, as someone who needs healing in the same way I need healing. If you have a healing or love grid, add their name to it. And add your own. I pray for them, whether I am still angry or not. I believe prayer (to the universe, or God, or your angels) activates your readiness to forgive. Does it mean the anger or hurt immediately dissipates? No. It means, you are showing Spirit you are ready to have this anger removed. 8. Ready yourself for new friends. I do this by working on my heart chakra. 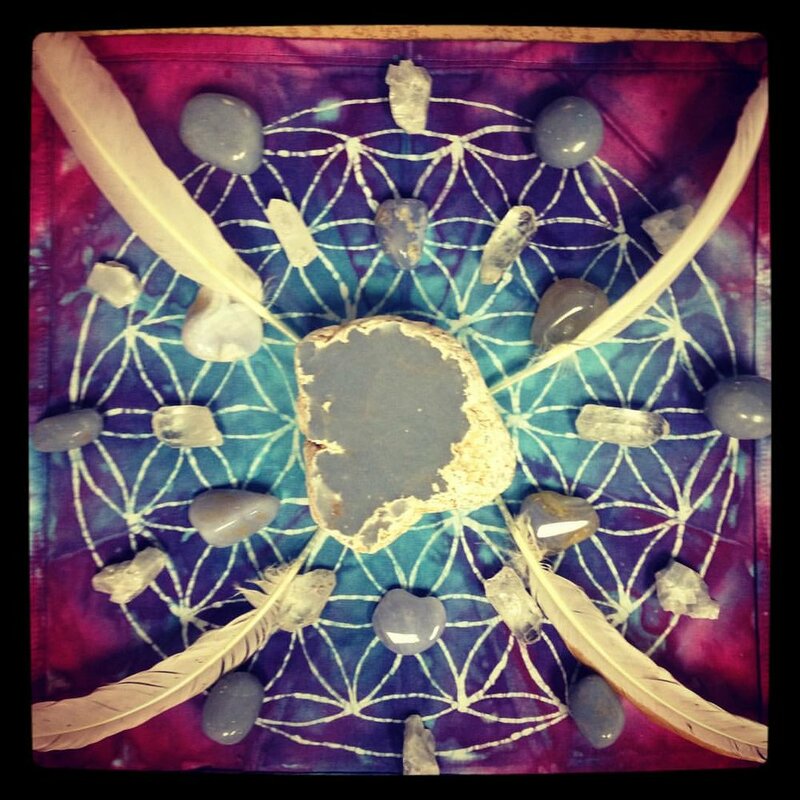 Heart opening crystal grids and layouts are wonderful. Yoga can be a great way, and just practicing self-care. Lots of self-care. What do you think about the end of friendships and healing? What do you do when a friendship ends? Share it in the comment section of this blog. 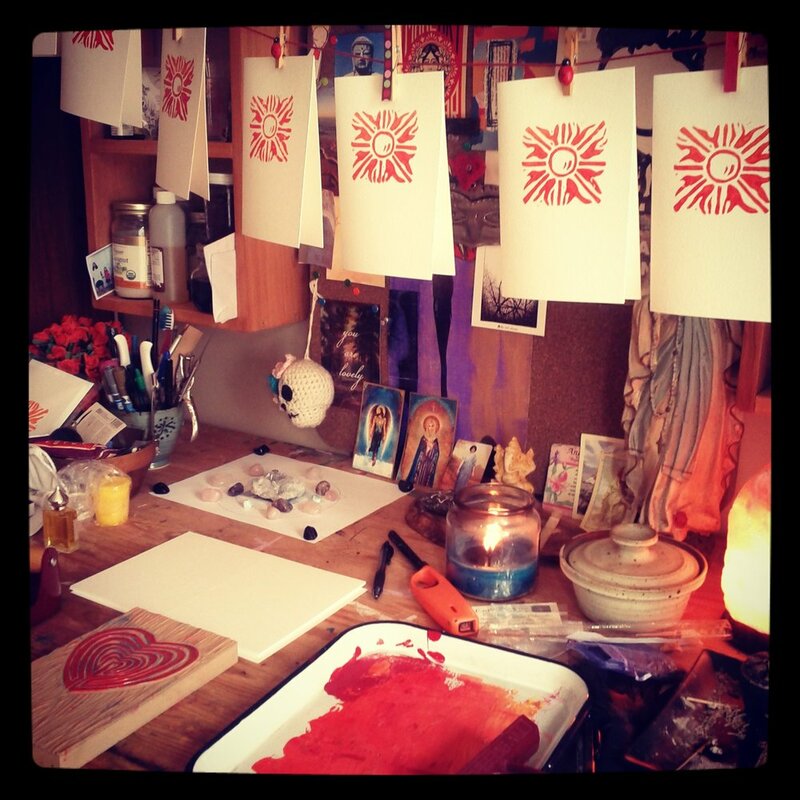 Every morning, I pull an oracle card or three and journal about the messages, and how they relate to my life. I then make an "Action List" of things I'd like to do based on the suggestions--like a Gratitude List, or a meditation outside. Little achievable things. Today's crystal card was Naisha Ahsian's Crystal Ally card--Aventurine Growth. As I sat with it, thinking about Aventurine, how I work with it, what I use it for, and how plentiful it is, I realized I had not actually written about it on my blog. How could that be possible? Sometimes are most potent and useful allies get taken for granted and neglected (spoken like a true mother and wife here). Green Aventurine's tones range from pale green to deep forest green, and these tumblies are great for pockets, mojo bags, and for heart healing work. The larger flat palm stone is one I use in crystal healing sessions for the heart chakra or after psychic surgery. 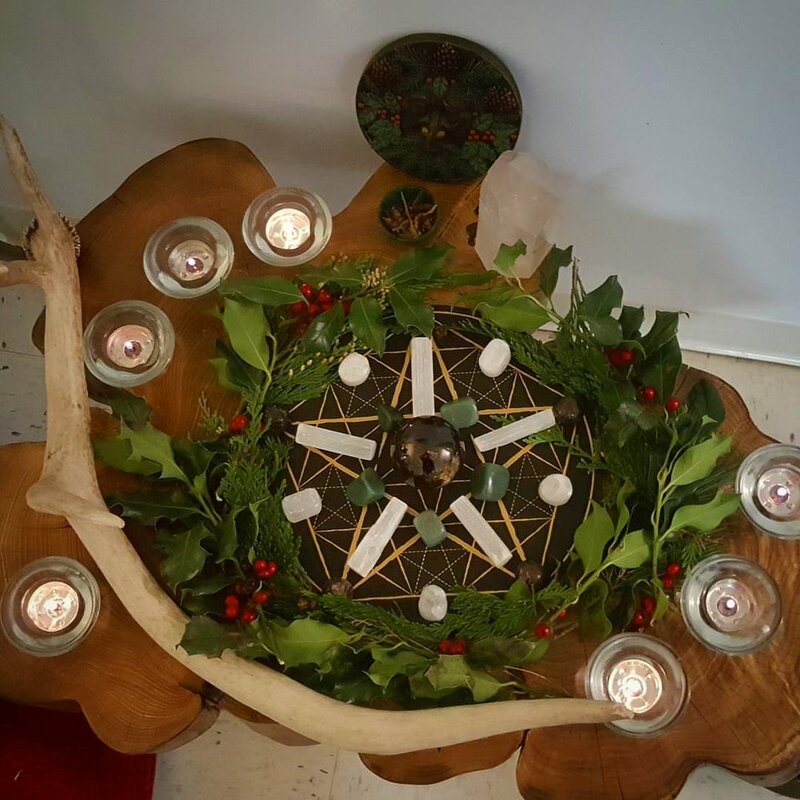 The Green Aventurine bowl in the back is a perfect addition to my altar spaces, and usually holds seasonal herbs, flowers or magickal correspondences. Today, I am remedying that. Aventurine belongs to the Quartz family with a Mohs hardness of 7. It works in water, out of water. On the body, in grids. As a crystal healer, Aventurine truly remains one of my crystal workhorses. Aventurine comes in a number of colors--blue and red, peach and other lighter colors, but most popular is Green Aventurine. The green, Robert Simmons points out, come from microscopic Fuschite particles (while the red is Hematite), which is fascinating to me as I use Fuschite in healing session as a pain remover. Green Aventurine resonates with the Heart Chakra, and helps one feel a kind of lightness of being. It subtly bridges the solar plexus (in my experience) by bringing confidence to the heart, helping one envision themselves achieving their heart's desire. In quite another way, the growth that Green Aventurine promotes is one of the heart and emotional body. How do you understand your emotional pain? Aventurine can be a partner in this tremendous work, helping you grow past your own limitations and the trap of suffering. What I mean by that is that suffering can be so all-encompassing, so all-consuming, that one cannot see a way out, or their own role in getting themselves out of the funk. Aventurine, gently, raises the vibration to a place of optimism. In this way, the quote, "Suffering is mandatory, but misery is optional" comes to mind. How and why am I making this suffering miserable? What is the root of my suffering? As a growth stone, it is most useful for these massive periods of change. Ironically, it calms the emotional body, helps to maintain a certain balance through the rockiest of journeys. The way in which Green Aventurine works is by helping you feel what you need to feel. It is my prayer in the morning--May I see what I need to see, say what I need to say, feel what I need to feel and do what I need to do for the Highest Good of all. Whenever we talk about feeling what we need to feel and growth, we have to remember that with the element of bringing in energy, we also must release. Aventurine soothes those wounds and facilitates the letting go of friendships, relationships, and situations that are no longer serving your Highest Good. In the next few weeks, i am going to be exploring this idea of release in my newsletter. Releasing challenges all our sense of loyalty, stamina, and self. Naisha Ahsian calls it understanding the truth of impermanence, which is not how I would have naturally articulated it, but is absolutely the nugget of this growth. Green Aventurine also has the reputation as a healer, and I use it for healing wounds in psychic surgery and cord cutting. It is also a wonderful tool for those who have gone through physical surgery, or cardiac issues. I also use it on other areas of pain or aches caused by disruptions in the etheric body, for example, if you are holding resentment that manifests as hip pain, I might put the stone over the hip. I think of growth in this way as growth of one's positive and healing properties to overcome the wound. It bridges the wound and the heart. Because it is so associated with growth as a concept, it is often used in manifestation work--grids, mojo bags, healing layouts. The green, the color of money, doesn't hurt either, as often magick practitioners recommend green for money and growth. It's a great stone to pocket for job interviews, or poker night, or even a romantic date. And I use it in my Abundance grids all the time. I welcome my spiritual, financial and emotional growth with optimism and joy. This week I mentioned Rhodochrosite in my Tarot of the Week for the Three of Swords, and with some hard heart situations for me this week, as well as the holidays coming up, I thought it was the perfect time to discuss the tunning Rhodochrosite. A few years before I began taking my coursework for my Crystal Healing Certification, I had a normal kind of week. 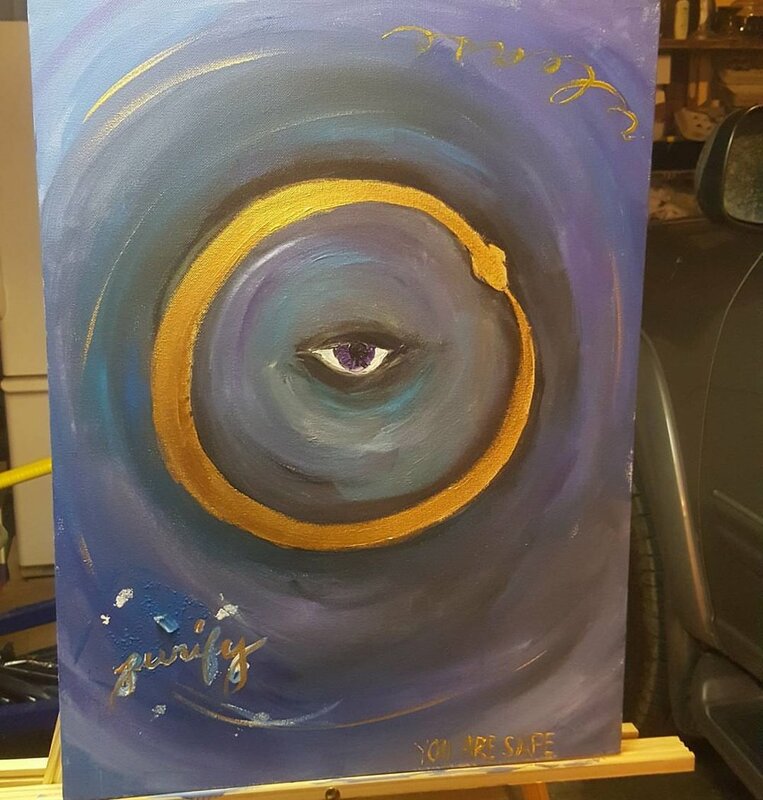 My third eye was very open to signs, coincidence and messages from my guides. Really, what I had been doing was intensely working with crystals to open my third eye. At the time, I didn't much work with heart chakra stones on my own. Funnily, though, when working with other healers, they all felt that my heart was almost entirely closed. Years of grief and isolation closed up my ability to give and receive love properly. Man, did I really have that upside down! The heart is the way to the third eye. All the lower chakras are keys to psychic work. In fact, you must must must balance the other chakras. It is imperative to not only good physical health, but psychic, emotional and mental health. I didn't know. All I wanted was to have these messages I had been getting all my life to be clear, for me to see what I needed to see. Clarity was my goal. For that week, it seemed every book I opened mentioned Rhodochrosite. A crystal card would fall out of the pack and inevitably there would be Rhodochrosite staring at me from the floor. I turned on one of my favorite Blog Talk Radio show and they mentioned Rhodochrosite, which is strange, because it is not a common stone, per se. It culminated to a weekend class I took where the instructor was wearing a massive pendant of, you guessed it, Rhodochrosite. It was so stunningly beautiful, so rich in texture and color, I was in love. And in that one week, I had no less that six signs about Rhodochrosite. A few weeks later, at a gem show, I found an entire jar of natural Rhodochrosite, and bought it up, then began working with it. It was then that I really heard the message my guides had been telling me. Fix the heart, and the psychic abilities will follow. 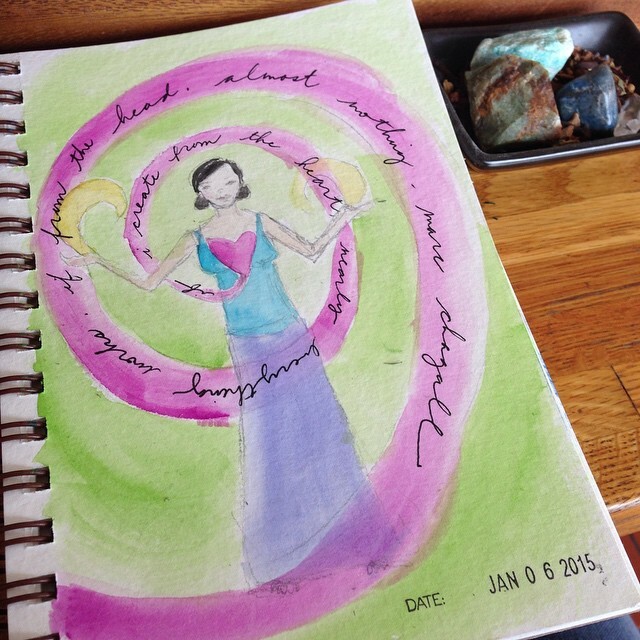 And so, in earnest, I began really focusing on any heart blockages. See, I thought that if my heart was open, I would be a gaping wound, ready to be easily injured. That also is a heart chakra imbalance, the one of being too open. This long opening (sorry!) is a way of reminding you to pay attention to your guides, and the crystals they are bringing into your life. 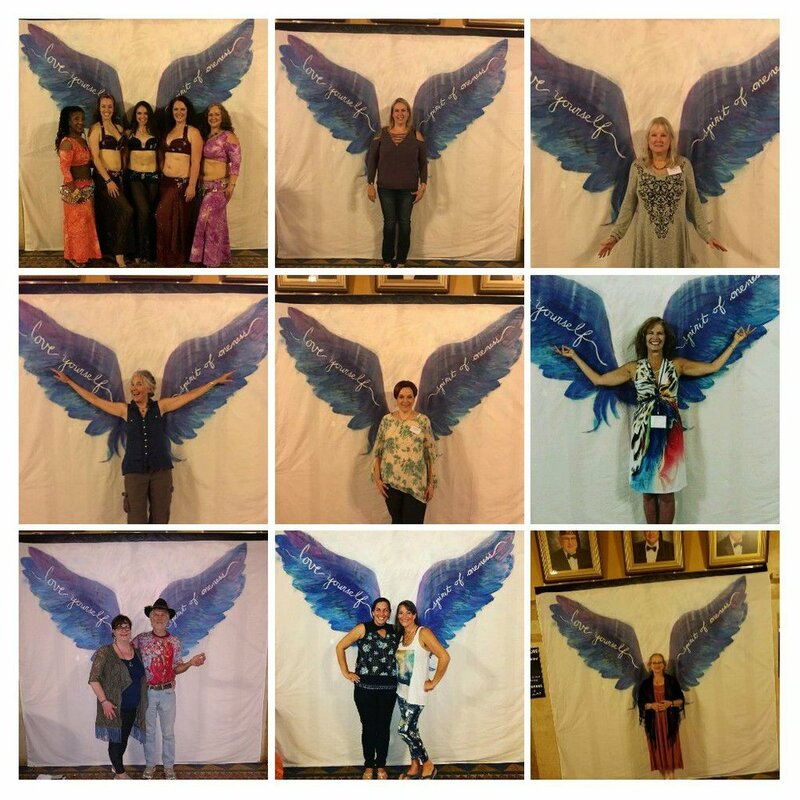 Let every interaction be a conversation with your guides, angels, and the Divine. If you spend a day in that kind of receptive space, it is amazing what you find out about how to heal your own spirit, and truly, how to be of service to others. When I began reading and working with Rhodochrosite, I simply could not believe how perfect it was for me and where I was in my healing. This is why I think it is so important for people to head to a crystal shop and just take off your reading glasses, so to speak. Just go where you want to go, touch the stones you want to touch, place them on your third eye or heart,and feel the energy. Choose based on what you are most attracted to, either visually attracted to, or vibrationally attracted to. So, Rhodochrosite is a stone of self-love and self-compassion. With a Mohs hardness of 3.5-4 (watch for water), it grows in a hexagonal system (trigonal too), and so it is great for five pointed star grids, for my grid students. Where Rhodochrosite's beautiful healing is most felt is in the wake of trauma and healing. It helps gently move the energy away from this fear for survival to trusting again. It is also wonderful to remembering those repressed memories that have created energetic blockages. But without the kind of extreme, demanding memories that mark say working with Malachite. Not that Malachite is bad, but it simply is less gentle than Rhodochrosite for this heart healing work. Interestingly, Naisha Ahsian notes that it is a great heart bridge for lower chakra and upper chakra work, which is exactly why my guides were probably pushing this stone at that exact time. For me, the key to Rhodochrosite, what made it such a game changer in my life, lies in the concept of self-compassion. 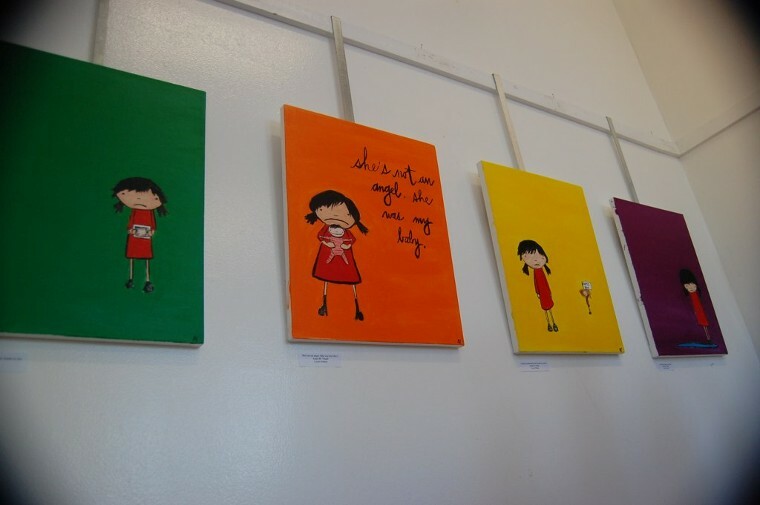 There is a wonderful book by a psychologist Laura Neff called Self-Compassion. She lays out very specific ways to work with this concept. For me, Rhodochrosite IS the stone of self-compassion. If we see self-compassion tweaked and moved into an unhealthy place, it is self-pity. Self-pity, I like to say, is self-compassion run riot. Self-compassion isn't "Poor Me;" it is an acknowledgement that what we went through was suffering. We sit with it without running the story line over and over again. We simply let ourselves feel the grief, as we would with another. We hold ourselves. And then we move to the next feelings. Rhodochrosite remains the best ally we have for this heart chakra work. Personally, I think Rhodochrosite resonates beautifully with the energy of Dravite, or Champagne Tourmaline, and Almandine Garnet. 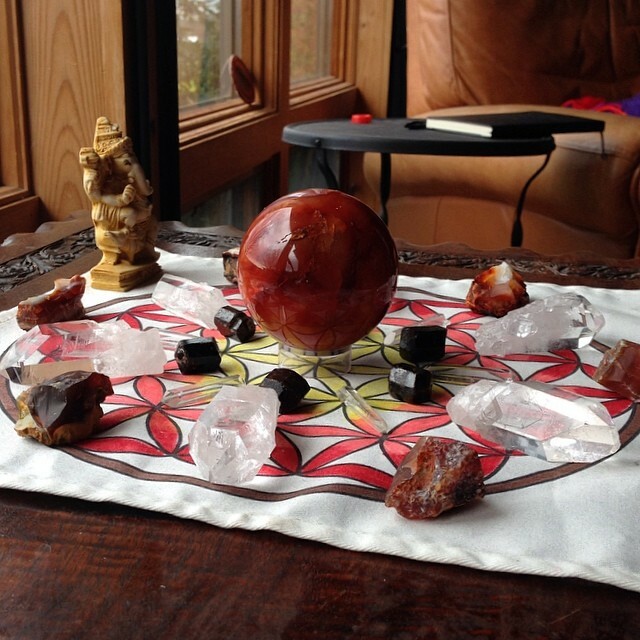 These are Root Chakra stones that really can support and ground your self-compassion work. The grids I have created when doing self-compassion and healing work have included these three stones. I heal all wounds from this life, past lives and future lives with compassion, attention and love. Sometimes the best thing to do with a crystal is to get seventh grade science class on that baby. I dare one to look at a Fluorite under UV light (black light) without ooing and aahing. Fluorite, crystal of the week, is so named for its fluorescence. Fluorite comes in a variety of colors from clear to pink to green to purple. And most colors in between. Most people know Fluorite by its multi-colored pieces containing purple to green in the same piece. Yes, a beautiful stone by any right. Fluorite has a natural octahedral growth pattern (or cubic), and in this way beautifully lends itself to work with sacred geometry. You can find natural octahedral pieces of Fluorite and woweeee...just hold it. Mama. Fluorite does have a Mohs hardness of 4, and should avoid water. So, what does one use Fluorite for? It is a wonderful tool for students, academics, scholars and anyone looking for mental clarity and acuity. Fluorite balances the aura, and helps cleanse any debris that lingers and clouds the aura (hence the mental clearing aspect of Fluorite work). If you work with Tarot, this is the stone for Swords--a wonderful, Airy ally. If you think about the suit of Swords, in its highest manifestations, then you understand Fluorite. It is about logical, mental stamina, decision making, coherence, thought and perception. It is a great stone for focus. So, if you are feeling all over the place, use Fluorite to help you focus on one goal at a time. Purple and Magenta Fluorites are wonderful to Crown and upper chakra work, opening the transpersonal chakras to connect with guides. Also Fluorite is an awesome ally for psychic work. 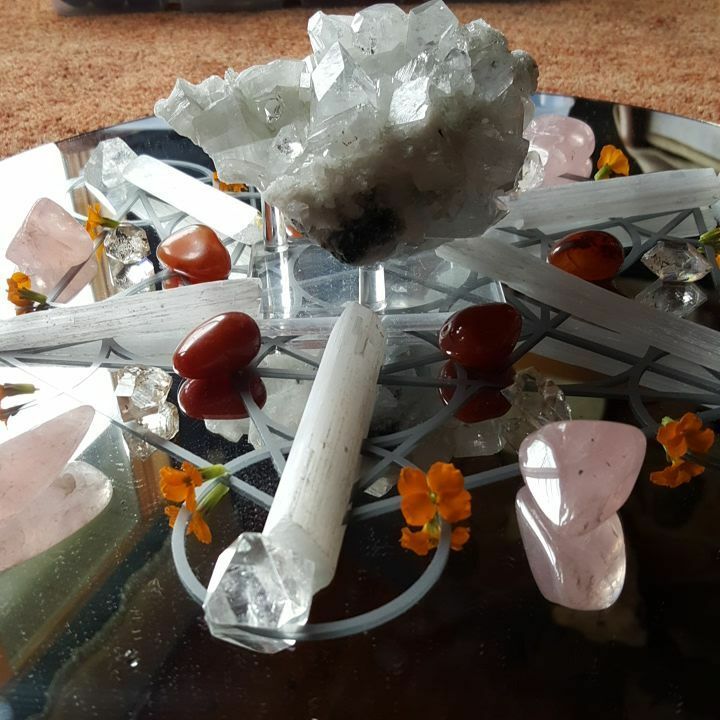 I use it in crystal healing session where I feel muddy energy with my client, helping to cleanse the aura before I delve deeper into chakra work. Different colors of Fluorite have different strengths on the body, etheric body and chakras. Green and pink are wonderful for the heart chakra, especially heart work that lightens the connection to others. It also helps connect the heart with the mind, bringing work into heartcenteredness. My mind and heart are awake, alert, clear and active, working in unison to make the optimal choices for my life purpose. Tell me about your experiences with Fluorite, or anything else in your mind. The large stone is Lilac Lepidolite with Green Tourmaline in matrix, the tumblies are Lepidolite. It ranges in color from purple to pink to lavender, though it can be almost clear or grey. Take a deep breath. Release all cares and worry. Just staring at Lepidolite is calming. I am writing today about a stone I've been working with this last week as our house has been on the market, and we are getting ready to move. Lepidolite has been a personal ally for helping me deal with any worry, anxiety and to find and reconnect with serenity. It certainly has the reputation and healing properties associated with emotional healing and balance. Lepidolite is a soft crystal with a Mohs hardness of 2.5-3 (so, not great for getting wet), and is a lithium containing crystal. Lithium crystals include Tourmalines, Kunzite and Petalite as examples. so Lepidolite resonates really beautifully with these crystals in layouts and in energetic work. 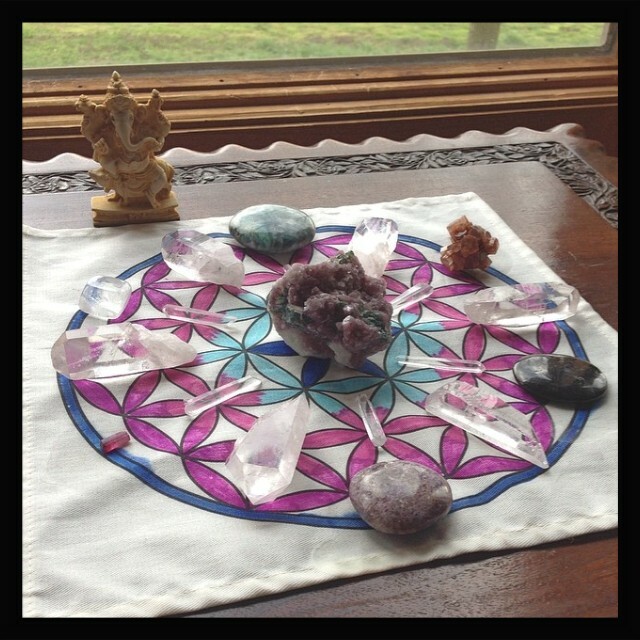 Lepidolite works beautifully in grids for difficult times. 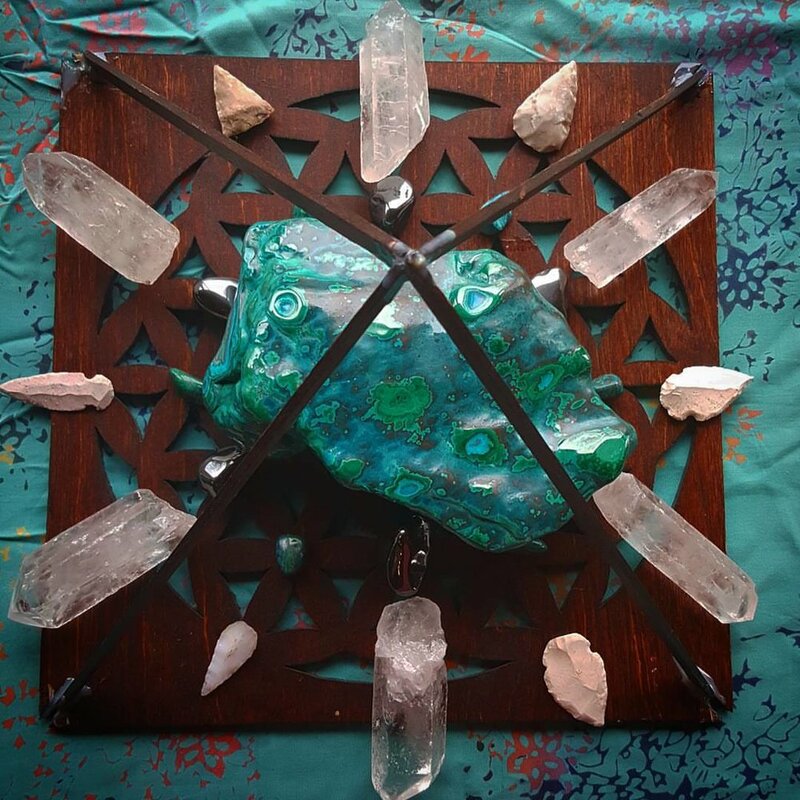 This grid created to ease the transition of a move (focusing on anxiety and worry) has a Lepidolite with Green Tourmaline stone as its center, Lepidolite around the outer grid and Lithium Quartz and Quartz clusters in its inner grid. Lepidolite is a wonderful stone to use and work with when you are making changes quickly (which is why it is part of my life right now!) It is great ally for those in recovery as it is a stone of acceptance, serenity and hope. What I love about Lepidolite is its subtle, gentle energy of change. And yet it is powerful in that way. It is supposed to be great for children with Attention Deficit Disorder with or without Hyperactivity. It can also be great for dreamwork and for relief of nightmares. It resonates, not surprisingly, with both the heart chakra and the third eye. (All those stones that help you see the same situation differently can be used for the third eye.) 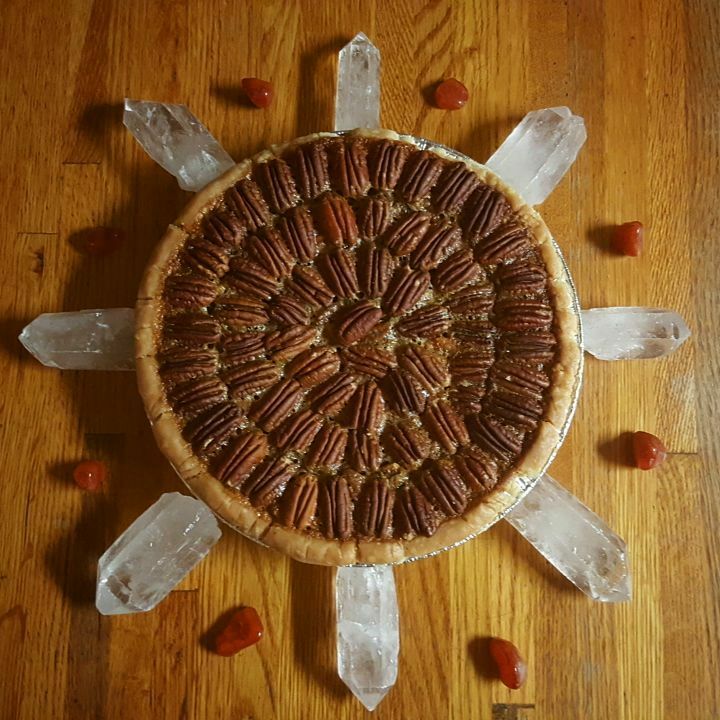 I often use it in Chakra Balancing Layouts as a third eye stone for those who come in stressed out from their job or life. As a high-Lithium stone, it resonates nicely with Lithium Quartz and Tourmalines like pink tourmaline, red tourmaline, or green tourmaline. Naisha Ahsian talks about Lepidolite's emotional balancing qualities, "Lepidolite assists one in perceiving and releasing past emotional trauma, which one may still be unconsciously holding. It prevents on from using such trauma as a badge of courage or a secret source of pride." WOW. So, in this way, it helps change your identity around a trauma. Part of what I have sensed with working with Lepidolite is how it grounds you in the present and in gratitude. I work on people with a calming grid of Lepidolite and Lithium Quartz and so often, they sit up and begin talking about the things they are grateful for, apropos of nothing. I know for me, I have use Lepidolite in meditation and felt very present. I once heard this phrase that thinking of the past is living in guilt, and the future is living in anxiety. Anxiety is carrying tomorrow's load with today's strength, carrying two days at once, draining you of the strength to face the thing you worried about. So, I personally use Lepidolite to restart my day. Have you heard that phrase before? You can restart your day at anytime. When I do restart my day, I pick up Lepidolite and meditate, even for as little as five minutes. In the Book of Stones, they have a separate listing for Lilac Lepidolite, which comes from Zimbabwe (the only place it is found). Those who understand this language might get very excited, but the Lilac Lepidolite blends with the Pink Ray of the Heart and the Violent Flame of Purification (Saint-Germain's Violet flame). It is an important stone for spiritual work and Divine connection. This Lilac works with the Crown and Heart rather than the Third Eye, and bumps up the soothing relaxing energies of Lepidolite. It is a great spiritual stone, and I think would work well for those who are working with Spiritual Anxieties and releasing vows and issues from Past Lives. It also would be a great ally (any Lepidolite really) for grief and loss. I release any thoughts that might be inhibiting my deep trust in the Divine. So much of how we interpret Tarot is based on what we think of as challenges or as rewards. As a mother of two young children, solitude is a gift, a precious pearl, that I savor and fall into with open arms. While others take a moment of quiet as an opportunity to check their phone, call someone, reach out, connect. Such is the vision of the Four of Cups. Solitude and reflection, at times seen as a punishment and other times as a reward, primarily defines this card. What do we do with our time? How are we reflecting? What are we reflecting? To begin with the numerological implications, four is about stability, like the legs of a table. The balance is from all sides--emotional, physical, mental, spiritual. For the Four of Cups, this is about retreat for emotional stability. But it is far more complex than what meets the eye. For introverts, this card is not in the slightest bit off-putting. Here is a solitary figure in retreat, sitting by a tree with arms crossed. For extroverts, this card is often interpreted as a Kierkegaard says, a kind of punishment, or maybe a self-imposed exile. Not a positive time, per se, but one that lacks gratitude and openness. When the figures arms cross the Heart Chakra, we have a certain level of being emotionally closed. Nothing is entering the heart, nothing is leaving it. Often, this position is interpreted as a kind of brooding, or unappreciative position. Certainly, the fourth cup, the one from a cloud (often the symbol as a gift from God, or Divine inspiration, or a new idea) , is right in front of his face, but he cannot or will not look at the option (the last leg of his proverbial table) that is right in front of him. This closed position coupled with the downward gaze suggests a self-questioning, self-doubt and a kind of depression. I have heard it interpreted as a kind of apathy and passivity that holds the seeker back from emotional growth. But that is not the only way to see this card. we often need to close our hearts, not be so receptive to the feelings of others, to truly assess any given situation, particularly one regarding our own emotional well-being. Do I break up with that girl? That is often a question someone poses to the Tarot. Well, assessing that question would be terribly difficult if you were spending 100% of your time with her telling you she loves you. You need the space, both physical and emotional, to really get to the heart of the matter. Perhaps the seeker has worked hard, been putting his or her efforts into her work. Maybe she is worn down, worn out, needing time for solitude and reflection. This is the card of an emotional time-out, and a recognition that hard work and dedication gives us the luxury to take time to reflect on our work. When I say luxury, there is nothing here to suggest that this is a financial or material suffering. In fact, the sky is clear blue, the background is serene, there is no turbulent water (emotionally chaotic symbol)--this turmoil is internal, rather than external. That is important, because this card reminds us that this crisis is self-imposed. Part of the implication of this card's brooding is that the seeker cannot see how good he truly has it. So, this card can come as a reminder that this is all in your head, and this time out or period of reflection, while necessary, is not anything like a punishment. The reflective means end, of course, in emotional stability, as Cups are the suit of emotional stability. This solitude is often the exact environment in which creative solutions and glorious inspiration comes. 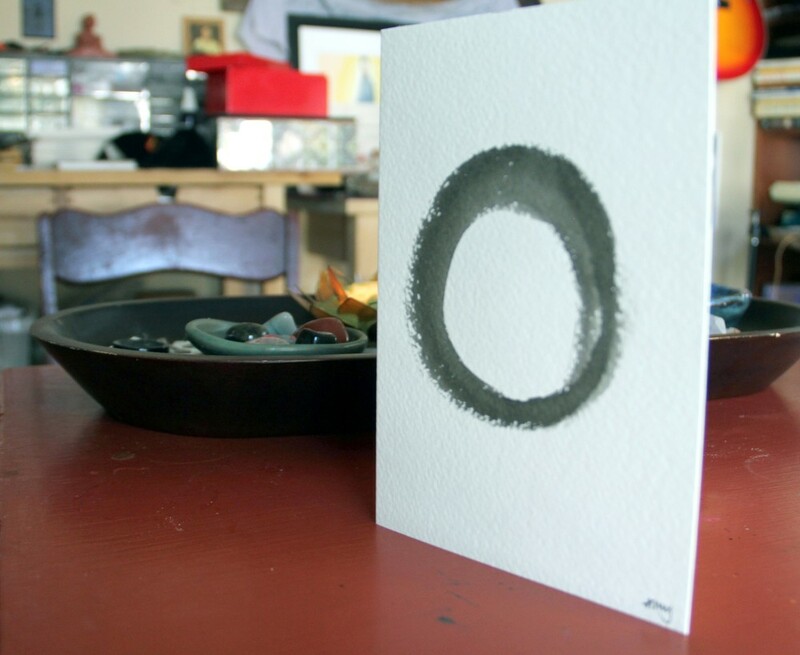 The underlying quandary with this card lies in where you are in your time of solitude. Are you using it for enlightenment, or are you using it to wallow in your sorrows? Are you searching for inspiration, or are you resigned to your lot? Are you able to make decision based on gratitude? And when your time of reflection is complete, are you able to reach out and grab your last cup? Or will you let the opportunity pass you with inaction? When a client pulls this card in a reading for me, I often tell them that the time of solitude and exile needs to be transformed into a time of reflection and enlightenment. You are on your proverbial mountain meditating. Take the time to be enlightened. Open your heart to your Higher Self. Listen to all the wisdom within you. Then take action with trust and confidence. I take time to listen to my Higher Self. Many apologies for the lack of crystal post and newsletter last week. I have been ill and took a much needed time out from my blog. (No surprises why I pulled the Four of Cups today, right?) 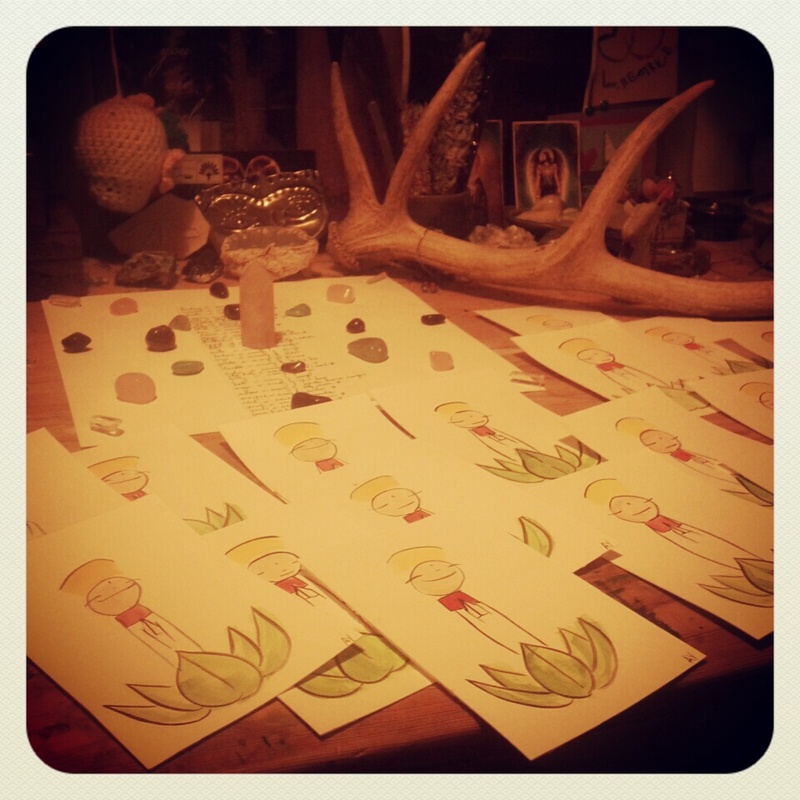 I'd love to hear what you think of the Four of Cups and anything else coming up for you. Spirit has a sense of humor to move from the Nine of Swords' worry and insomnia into the Lovers. Sleepless nights and difficult attachments often stem from love or the perversion of love. We worry. We toil. We obsess, but the root of the Lovers is nothing like worry and toil. It is absolute trust in the Divine and further in the divinity of love and the possibility of connection with another human being. This week, we revisit the Major Arcana with a card most people want to draw--the Lovers. As we begin to take in the images of the Lovers, we are greeted by two naked people, Man and Woman, standing under Archangel Raphael. Is it Adam and Eve? The first couple? The tree of knowledge stands behind the woman with a snake coiling around its trunk. It reminds us of the No. 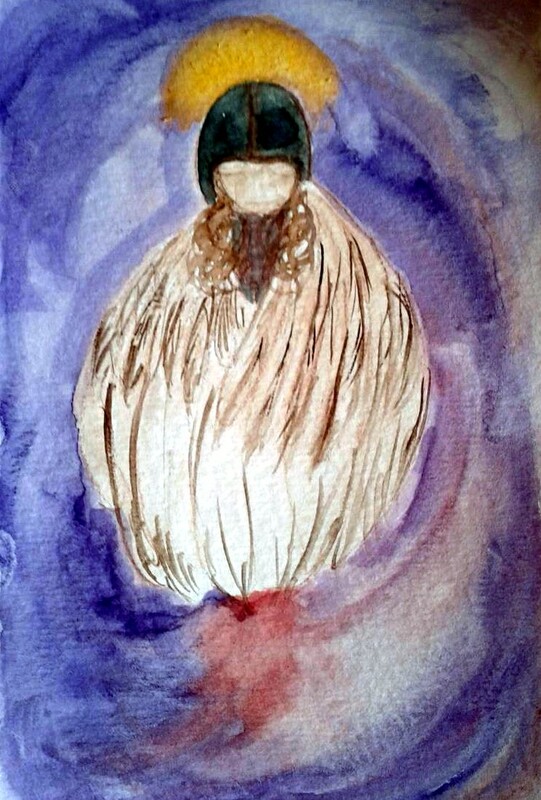 15 card of the Major Arcana, the Devil. So, the Devil lingers in the idyllic scene of the Lovers. It is so intertwined with the Devil card, you almost cannot mention one without the other. In fact, just because one wants the Lovers doesn't mean one should get the Lovers. We often draw the Devil when we are trying to will the Lovers to come. Notice the similar composition and images between the Lovers and the Devil. The two cards have very similar layouts. 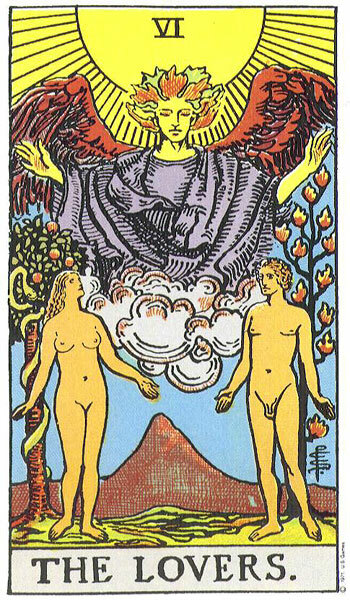 If you look at the Devil card, you notice that the figures on the front are the same as the Lovers. Archangel Raphael presides over the healing of the two Lovers on the No. Six card, while the fallen angel Lucifer presides over the couple on the Devil. Archangel Raphael's hair are leaves, while the pentacle sits on the head of the Devil--both are earthly symbols that mean two entirely different things. 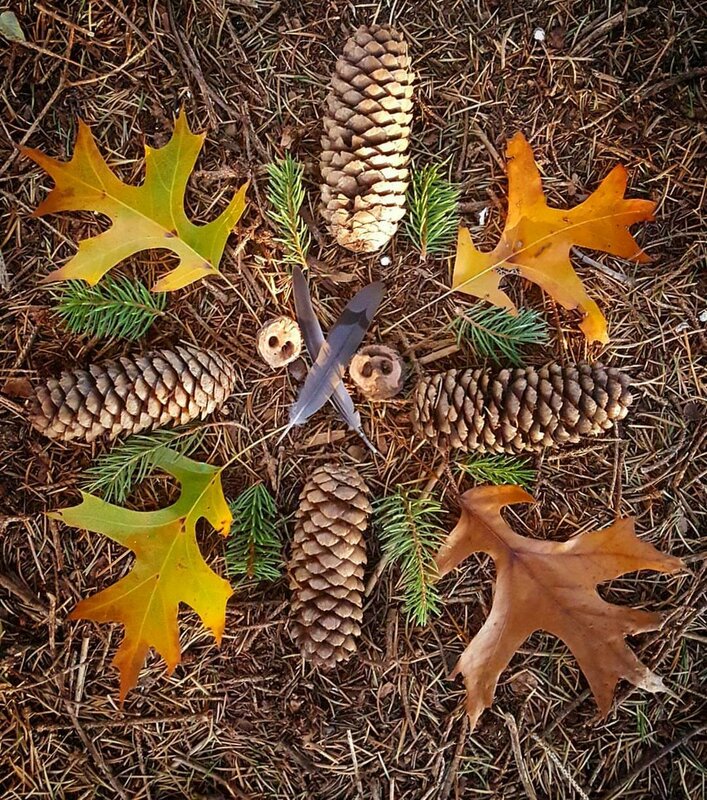 The Devil is about attachment to the material, while the leaves represent a kind of harmony with nature and Mother Earth. In this way, the two cards represent two sides of the same coin--love. The Lovers is the ideal love, the blessed love, the harmonious soul mate relationship, while the Devil represents the perversion of love, obsessive love, the attachment to the material, or the superficial, the fear of love, the lack of personal power (this powerlessness comes to represent addiction in the Tarot, also you can see that the female figure has a tail of grapes, meaning she is attached to wine), and of course, addiction. Juxtaposed with the Lovers, the Devil teaches us what love isn't. Or maybe even it is a warning about what love, selfish and self-serving without Spiritual connection, can become. The Lovers depicts what Marcia Masino calls the mystical rite of Kything, which means to "appear without disguise." Their nakedness represents the absolute vulnerability that becomes the couple's greatest strength. 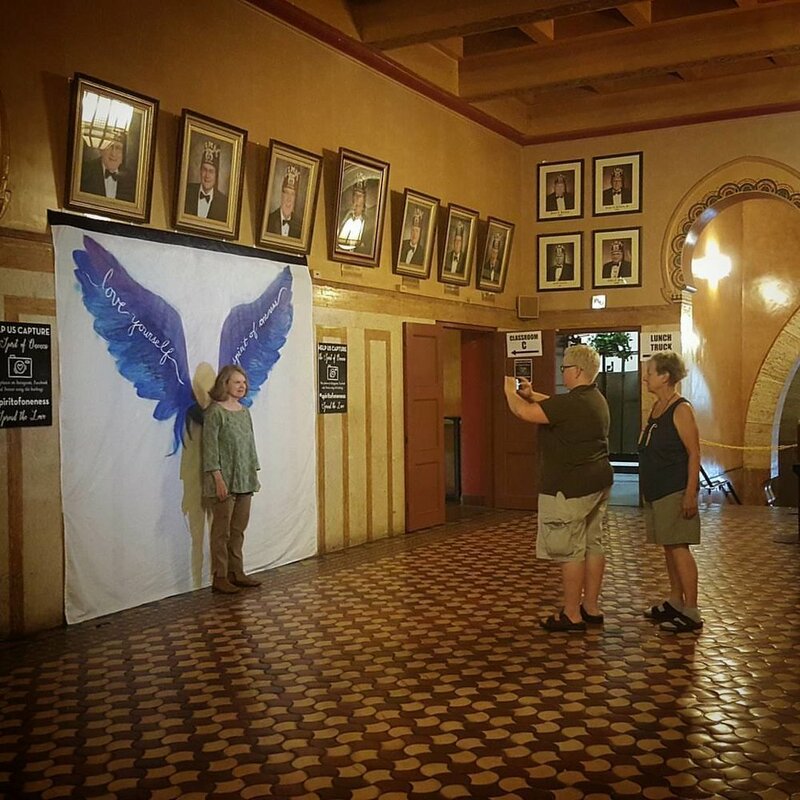 Ms. Masino says "kything is a method of spiritual presence whose purpose is to bring about a loving spiritual connection, union or communion between two or more persons without the spoken word." The sun shines over the whole scene. There are no secrets, no mysteries, no shadow issues going on. This person who you pull in the Lovers is your soul mate, your twin flame, your partner, your other half. And I think it is important to mention that Archangel Raphael is present in this card. He is the Archangel of Healing and Health. He blesses the two, helps them heal their wounds, nurture their past aches to move into a new spiritual awareness. By our openness with another person, we begin to bear our soul to the Divine. We allow trust to be our guiding force. It is easy in the throes of love, after all, to believe in God and the Divine. Fate, God, Divine pathways and connections, it all makes sense. 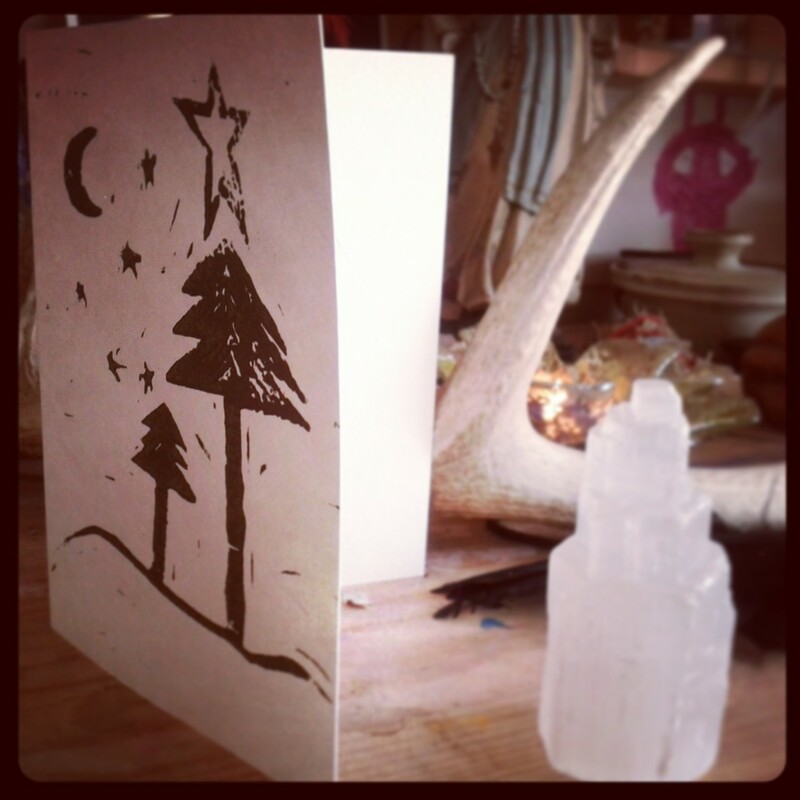 We are spiritual beings having a human experience, and this card is about the beauty of that human experience. The mystery of love enlivens us, invigorates our souls, makes us feel the absolute amazing sensations of being human 100 times more intensely. We are human, and it is beautiful. This is what our experience in a body teaches us. To be present. Remember the heart chakra, after all, is the gateway to Spiritual connection--the bridge between the material concerns of the lower chakras to the spiritual issues of the upper chakras. It is here that we learn to unite them, because in romantic love, we bring together all the lower chakra issues--Security from the Root Chakra, Sexual satisfaction from the Sacral, and Courage and Strength from the Solar Plexus with the Upper Chakra issues--Listening and Speaking the Truth of your Soul in the Throat, Seeing and opening to your Soul Path in the Third Eye, and finally, opening the connection to the Divine in the Crown. We play all this out through our Heart Chakra in the Lovers. The presence of the angel is not a mistake. There are six archangels in the Tarot, and they appear in the Major Arcana. This is the ideal, then, the oneness of this trinity--the Lovers--Two Humans and the Angel, symbolizing the Divine. We invite God into our partnership and we are granted a lifelong relationship. It is the power behind healing, as Archangel Raphael reminds us. I open my heart to loving, being loved and trusting in love. Self-love, divine love, romantic love, parental love, forgiveness, friendship, compassion, familial love...love love love. It is the seed to spirituality. The Heart Chakra sits at the center of you, not by accident, but because love is the center. It is the bridge from the lower to higher chakras, from existence to ascension, so to speak. And through which I believe, we filter all our experiences. How we are loved of, how we love and how we accept and how we are accepted. Rose quartz hearts are incredible popular for crystal healing work. 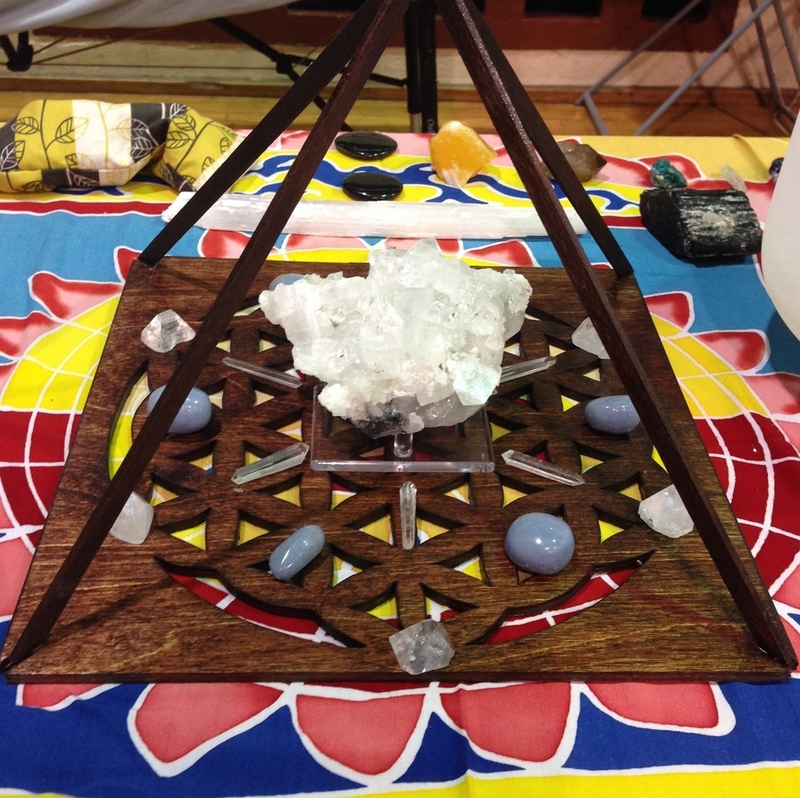 The Rose Quartz tower is great for a center point for grids, and can be put directly on the Heart Chakra for blockage releases. Raw rose quartz, shown at the left, is as beautiful as tumbled stones. Rose Quartz is THE stone of love, some would say. It is used in grids, jewelry, magic, dream work, love potions, meditations and crystal healing. It is a powerhouse of heart chakra energy, which is why it is so powerful and abundant. Healing the heart, heartbreak and all wounds dealing with trauma, loss and love, Rose Quartz helps to trust, to release boundaries, to open oneself. But its main role is one of compassion--self-compassion, compassion for others, compassion for the world. That is the essence of heart-centeredness. We are called to practice radical compassion and profound love. Rose Quartz resonates beautifully with global love, but also with romantic love, or relationship healing. Use it when you are healing from a break-up, or starting a new relationship. Actually both require great trust and an opening of the heart. While Rose Quartz's energy is gentle, it is by no means a pansy. It is a powerful activator of the heart chakra connecting one with Mother Earth. It is great as a connector of people. Place it in a room and feel a lightness of being, an ease. Or if it is a tough room, just an ease. Naisha Ahsian talks about the heart center as the "strongest generator of Light energy in the body--even stronger than the brain. The energy of Rose Quartz," she goes on to say, "helps the bud of the heart unfold into a thousand-petaled lotus of Light." 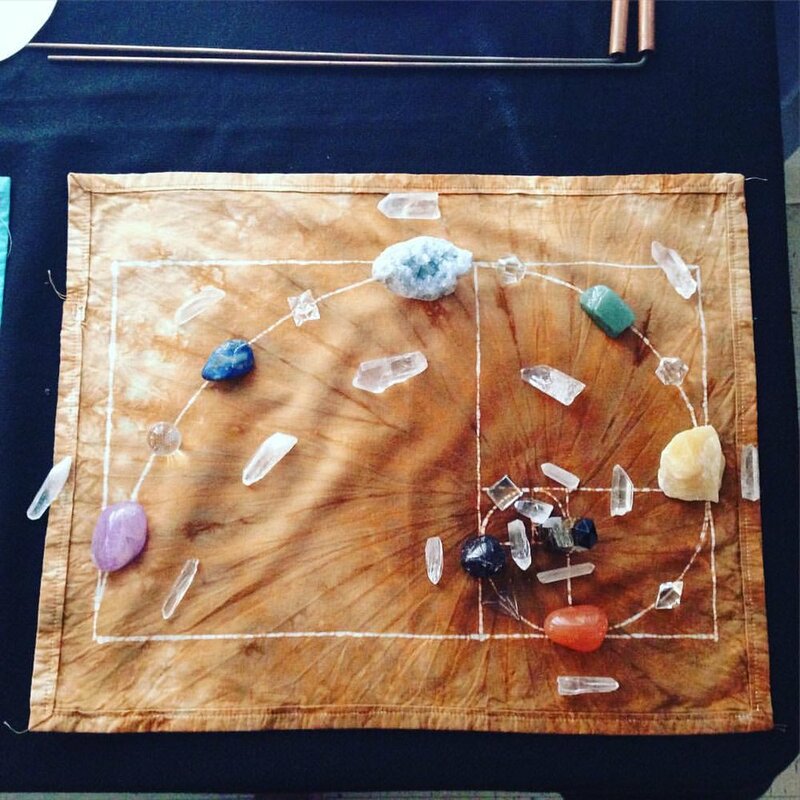 Part of what I imagined when I started this series of blog posts about crystals and tarot is to talk about crystals people already think they know as well as ones that my readers may have never heard of. I hemmed and hawed about Rose Quartz. What is there to say? It looks like it feels--gentle, beautiful, high vibrational. In our home, Rose Quartz is a perennial favorite. My six year old daughter Beatrice is perpetually asking me to buy her another Rose Quartz. She loves them, can't get enough of them. It is because children instinctually feel held, calmed, loved with rose quartz. Its beautiful resonance reminds them of that maternal love. Rose Quartz helps adults feel held and loved by the Divine. I open my heart to receive and express the energy of love. Malachite often grows with azurite in this amazing mixture on the left. Both with copper as a base, malachite-azurite is strong combination. Azurite is a third eye stone. The combination is a powerful ally to uncover those deeply hidden negative emotional thought patterns and to cleanse and heal them. It also resonates with the throat chakra, so it helps you listen to your Guides and Higher Self, then speak your truth. On the right, malachite alone has this incredible florette pattern, and banding. Great for drawing out impurities and protection against negative energies. My sister and I began collecting stones and crystals when we were young girls. My first stone was a lapis lazuli, and my sister's first stone was malachite. They were the two stones we first held, and talked to, and whose vibration we resonated with. Malachite's rich green color felt earthy, homey, protective, but I admit that the name alone, mal- as its prefix, made me imagine its qualities as more sinister in nature. (Cue maniacal laughter and creepy organ.) But the mal comes from the Greek either for soft (malakos), which makes sense with a Moh's hardness of 3.5, or resembling the mallow plant (malache), but with no evil intent. In the Middle Ages, though, malachite was often used to ward off the evil eye, and used as a stone of protection. As far as 3000 BCE, malachite was used in Egyptian jewelry and for eye shadow, as well as found in Ancient Greek and Roman artifacts. It still is a strong stone for protection. I'm citing Robert Simmons here because this information is straight from Book of Stones. He feels that malachite is one of the strongest stones for protection from negative energies, helping to keep your psychic radar tuned to the right frequencies. So you need to trust your gut when you have some malachite in your auric field. In fact, wear it so you can trust your gut and be able to sense those energies around you that are safe. As Robert Simmons says, you can literally use it as a cloak of invisibility when you are in an emotionally vulnerable place and need to hide from those posing a threat. It also works as a powerful psychic cleanser, drawing out impurities, helping to purify your EMF (electromagnetic field), and recognizing and cutting attachments in your auric field. Malachite resonates to the heart chakra. Actually, it resonates to the solar plexus as well, making it a beautiful stone to bridge that lower and upper chakra work. The heart work of malachite helps you manifest your dreams into reality. (Another manifester, cool!) When we think of the heart and solar plexus synthesizing energies, we think of our heart's desire, and our strongest will. 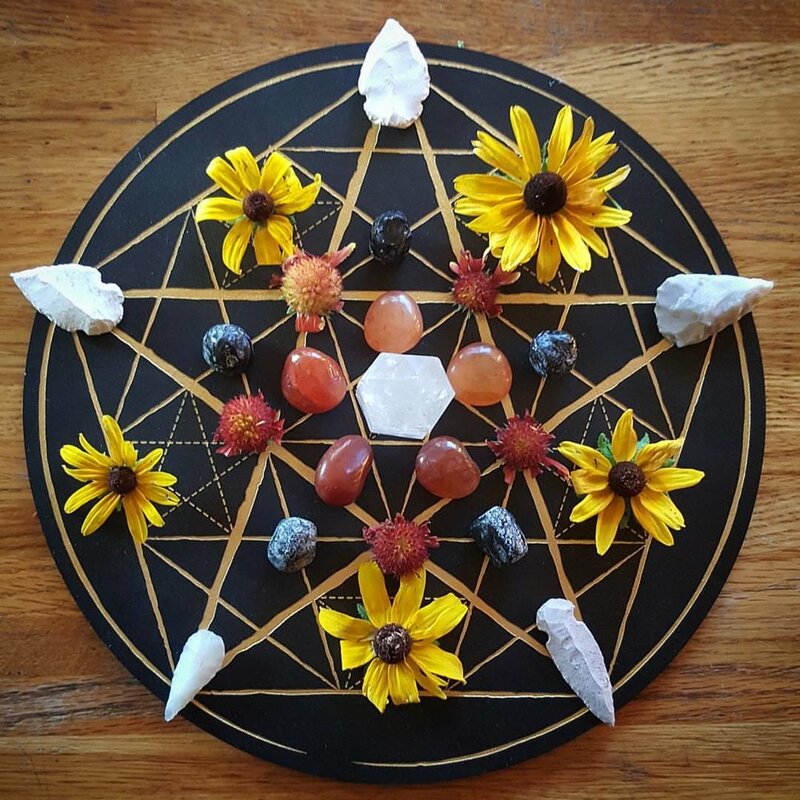 So, those stones that resonate with both heart and solar plexus help us visualize and achieve our heart, which is truly our soul path and Highest Good. So, use it to strengthen your will power for things like weight loss, or boundary keeping. It helps you hold that vision you have, to strengthen your will. With its strong, powerful vibration for the heart tied deeply with that will and fire of the solar plexus, it can be impressive for work those trying to figure out their soul path. Malachite is not for the faint of heart, no pun intended. Judy Hall calls malachite merciless, which made me laugh, because stones just raise that vibration, you become merciless, uncovering those deep desires within you and the things in your life no longer serving you. When I work with people to figure out soul paths and that deep discord that spawns the need for change, we often have this brutally emotional time of uncovering and rooting out the things that no longer serve. Manifesting dreams is not simply dreaming them, saying the affirmations and eh voila, it happens. We make a commitment to uncovering those things that are standing in our way of achieving our goals. Because those higher energies (living our soul path is the highest vibration we can have) need room to come in, your vibration is ascending, you are going to be attracting different things and people, and those habits and people not of a higher vibration fall away, sometimes dramatically, sometimes with difficulty and drama. It can be a painful process. Often, it is simply that place of feeling trapped that really is the trap. Malachite is an ally, as all stones are, in helping us raise our vibration to a different level, and it is a powerful tool for finding our soul's path. What I mean by that is that when we are dealing with base issues, like safety, security, monetary issues, addictions, etc., those are lower vibrational issues, root + sacral chakra issues, when you use a powerful heart/solar plexus stone, you begin to raise your vibration above the concern, to see it more clearly, more accurately, and give you that last oomph of will to push you into action to change your lot in life. And to change those things that once felt unchangeable. It helps you put cracks in those patterns that feel unbreakable, and truly, it helps you take responsibility for your actions. Many crystal writers warn against using malachite alone without a crystal healer. I find that soul path work, and intention setting works best with a coach, spiritual counsellor or crystal healer (or therapist/spiritual advisor/sponsor). But it is okay to use this crystal alone. My suggestion is to use it in small doses. Start meditating with malachite for a few minutes a day. Pick three minutes to start. Ask the stone what you need to learn from it, hold it in your non-dominant hand, and then sit in meditation listening for the answer. Yeah, I know, that sounds corny, but that is how we work with stones. Take notes on how you feel. Often, it is the stones that bring something up in us, that nudge us, or make us feel uncomfortable that are the ones that help us the most. They are trying to raise our vibes, and our vibes are very comfortable right where they are, thank you very much. However you use it, in meditation, in sleep/dream work, worn, or in medicine bundles, do not use malachite directly in elixirs or tonics. It cannot be imbibed as it is a toxic stone. It is fine to wear, but not fine to drink. A close up of the florettes of malachite. Its banding and beauty enhances the draw to work with it. Personally, I decided to write about malachite this week, because I have been working with malachite on my own healing. I bought a rather large specimen to help heal my Irritable Bowel Syndrome. 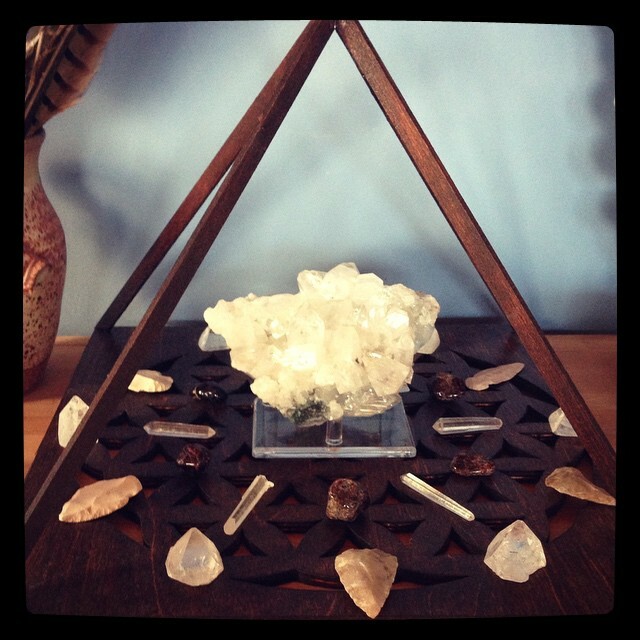 I wouldn't be much of a crystal healer, if I didn't use stones for my own ailments. Beyond emotional, mental, and spiritual issues, crystals help with physical ailments. Malachite is an anti-inflammatory, and helps draws out impurities. As a crystal healer, I use malachite for people with physical injury as I am doing other crystal work. Malachite helps calm that inflammation and pain. I healed a pulled ligament in my ankle with malachite in two days. (I share this, because I wouldn't have believed it possible.) For my IBS, I lay the stone on my belly for 10-15 minutes every night with a cross of Dravite to help alleviate my pain and other symptoms. It is my third night tonight, and I have to say my physical symptoms have been lessened, not taken away, but lessened. This is intensive work, and I'm grateful for malachite to be on my path with me. And as to the emotional work it is bringing up, I have had some amazing dreams. (Another reputed attribute of malachite, as a dream interpretation aid.) And actually, come to think of it, those dreams are pretty dang clear about what I need to be releasing. Beautiful Malachite. I align my personal will with my understanding of Divine will, and I move forward with clarity and confidence. The New Moon in Leo, August 6th, reminded me of the work of the dark moon. New Moons are times of transformation, new beginnings, releasing, and the hard work of change. We often find ourselves withdrawn or rather introspective when the Moon is perfectly aligned with the Sun. I often talk to people who tell me they are in a funk, or not relating to people, then I say, "Well, it's the new moon. That is to be expected." And they seem surprised and relieved. 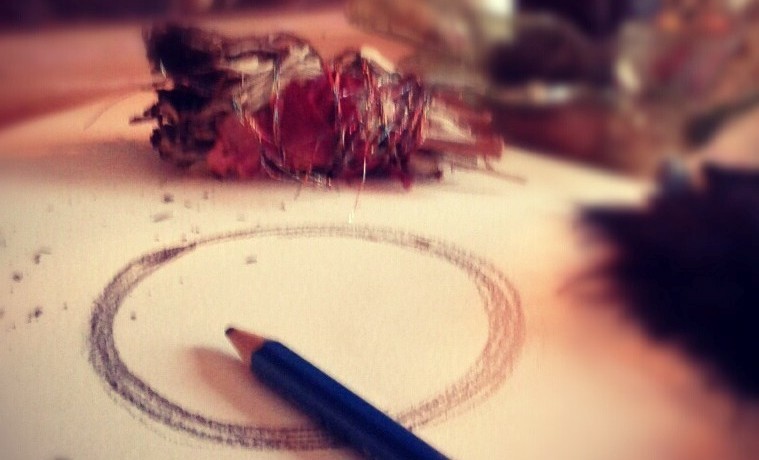 The New Moon is a great time to do this introspective soul work, and the work of manifestation. 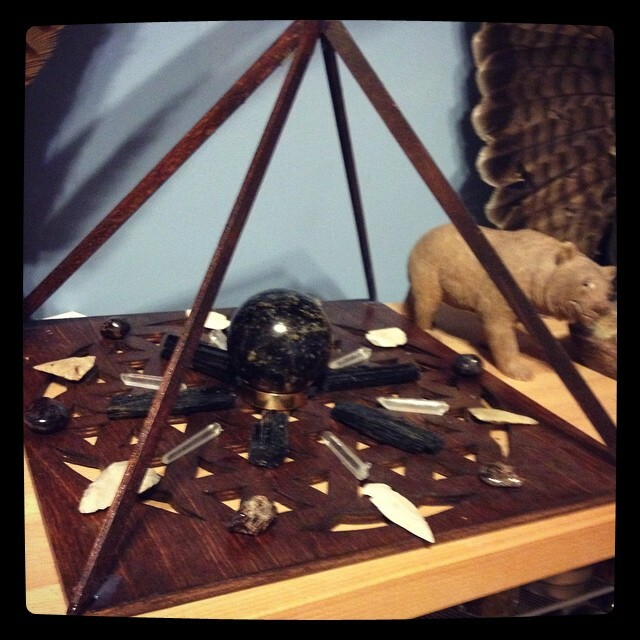 Crystals help enhance our own work--soul work, physical work, emotional work, spiritual work, and Divine work. When I talk of manifestation, I mean, setting intentions for goals that are attainable. When we set intentions to "lose weight," for example, we may start a new diet, or exercise regime, but if we don't get to the cause of our weight, those things may be for naught. So, the work of the New Moon is setting intentions, then allowing yourself to journey to those places of our own Shadow self, the part we hide from others and ourselves. Shadow work is a Jungian idea, and the time when the moon is in shadow is the most auspicious time to work with these shadow issues arising. 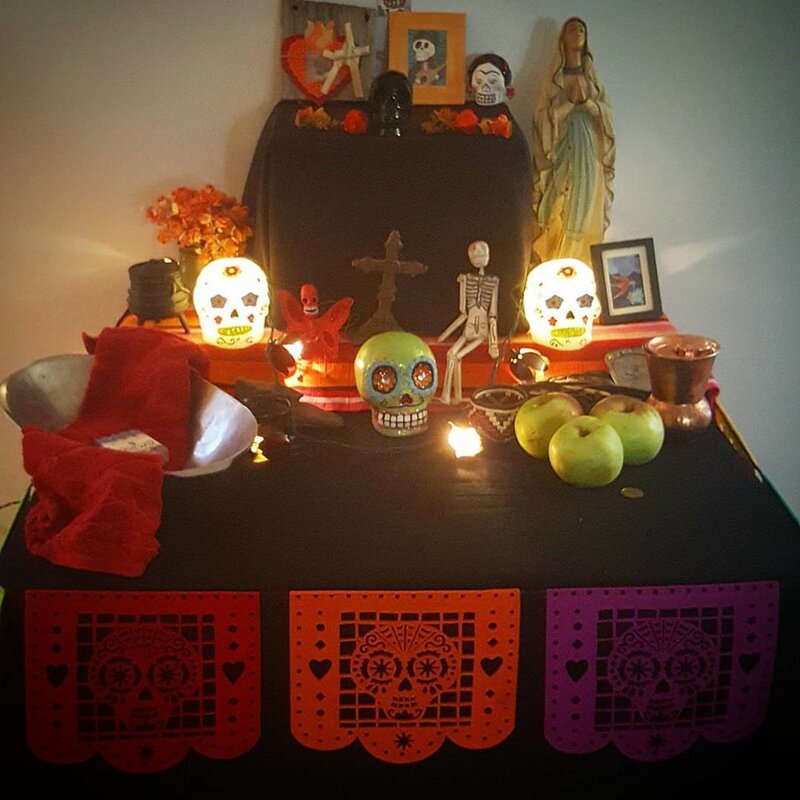 I often work with people on medicine bundles during the new moon, then throughout the month, we talk about the shadow work arising, the emotional issues coming up for them. What is blocking you from being everything you want to be? Setting intentions in the new moon helps you identify and work on these issues. This is the true work of the new moon. Labradorite is a stone of the Dark Moon, as Athena says. It is the gatekeeper for shadow work, and it is sometimes referred to as the Magician's stone--the magic of our own potential, intuition, and power. What does this mean? It means, labradorite perfectly complements the New Moon energy, helping you gently uncover your hookable places, and open to your Higher Self and the secret knowledge that helps you grow. Labradorite is difficult to capture on film, because it has an amazing labradoresence--flashing rainbows, purples, greens, blues, golds, oranges, red...yet remains dark. Intention-setting and manifestation is not the only way to use labradorite in the new moon. This is a great time for journeying and deeper meditations. If you are someone building their intuitive gifts, including psychic abilities of the clairs, channeling, past-life recall, as well as other psychic tools, labradorite is a great stone for your toolkit. It helps you move between different dimensions, realms and realities with relative ease. When I said it is the gatekeeper of shadow work, labradorite helps you recognize that duality in yourself (and sometimes others) with clarity and wisdom. We don't go into arenas of shadow work lightly. We must hold it in high regard, being purposeful and respectful of the darkness and pain within us all. For people who want to work with labradorite, I often recommend holding the stone (in your non-dominant hand) in meditation. Asking labradorite what you need to see right now for your Highest Good. And let the visions come. Don't fret if you don't get the answers immediately. It often takes time to discern the voice of our Higher Self and trust our answers. Keep the stone in your pocket throughout the day, because labradorite assists in coincidence and synchronicity. So, once the question is asked, allow synchronicities and coincidence to speak to you throughout the whole day. Watch where your shadow issues rise. Recognize those things that no longer serve you. The New Moon is a perfect time to release those things, so allow labradorite to be your companion. You can also place labradorite on the third eye to assist in seeing what you need to see. You can feel the rush as your vibration rises to labradorites. Labradorite also is great for dreamwork. Take it to bed with you, place it under your pillow. Then write your dreams, visions, and inspiriations in a journal. Working with labradorite and a dream journal opens you up to working on those issues blocking your intuition, or the intuitive messages you are not hearing during the day. I open to the magic of my own intuition and Higher Self.